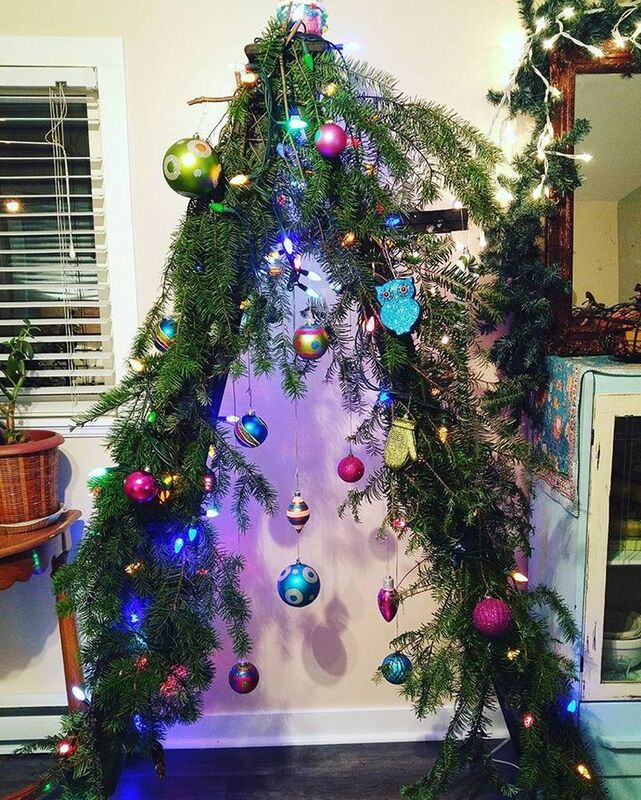 Who says a Christmas tree should only be an evergreen conifer tree? 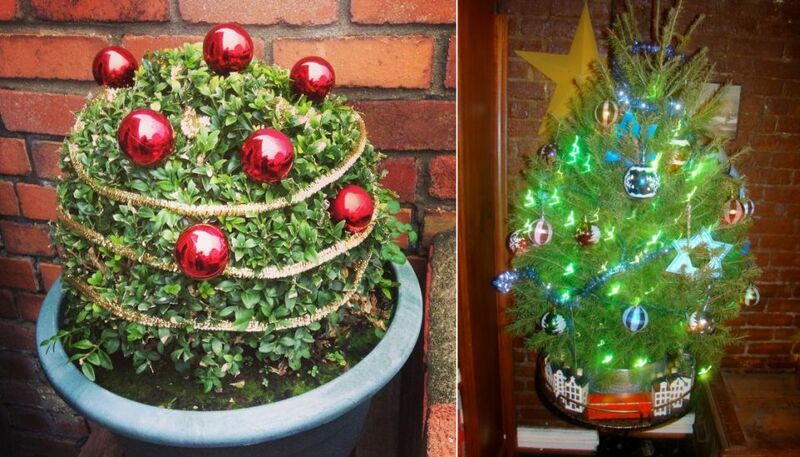 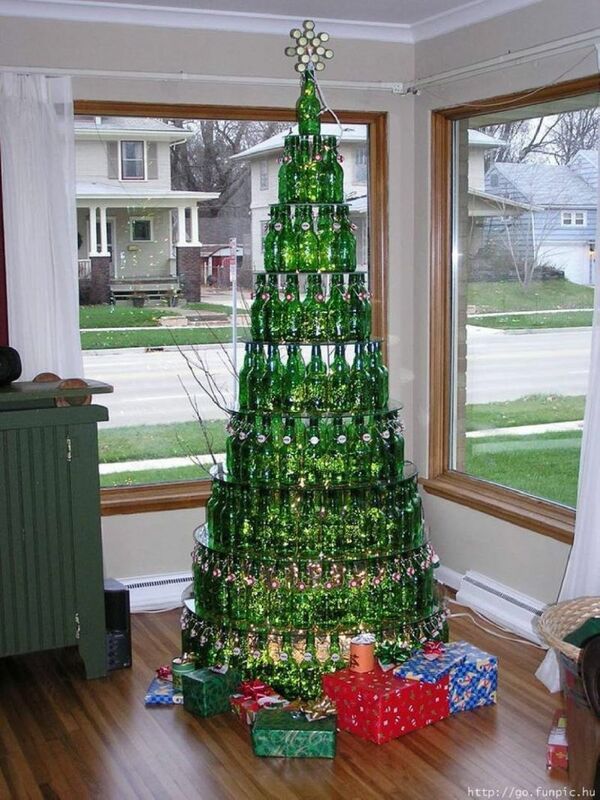 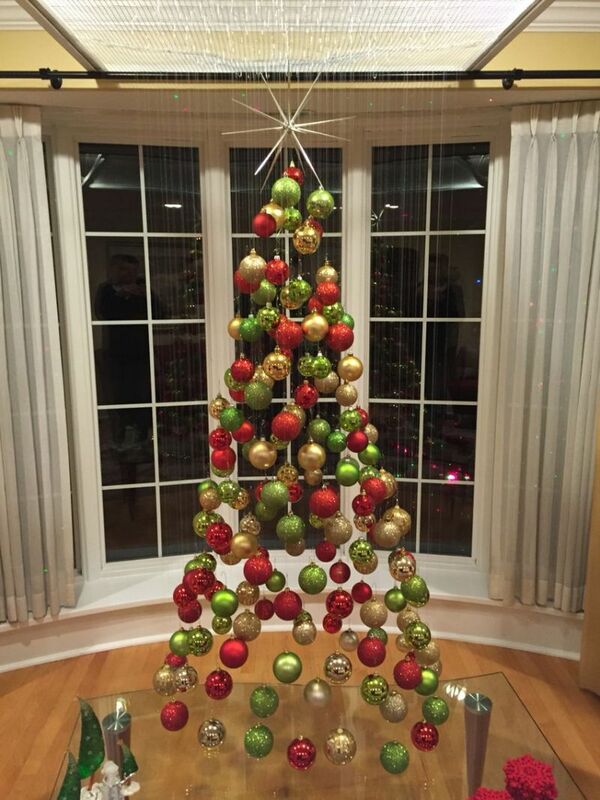 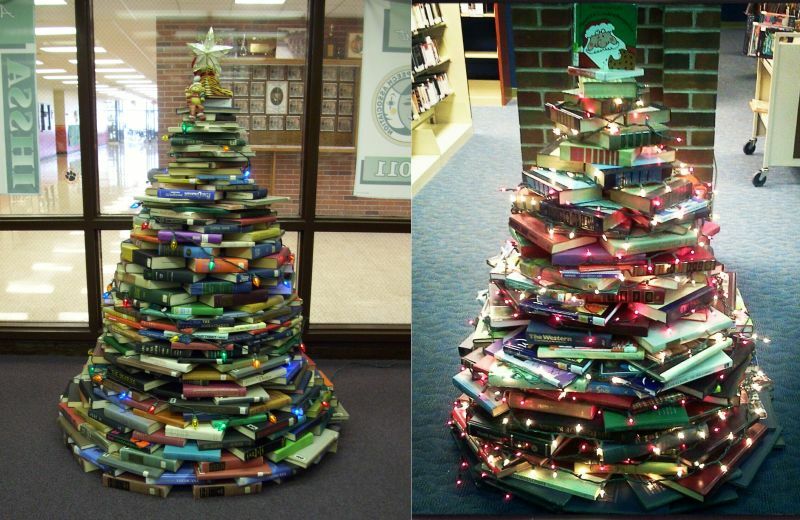 There are endless Christmas tree alternatives that will put you to think. 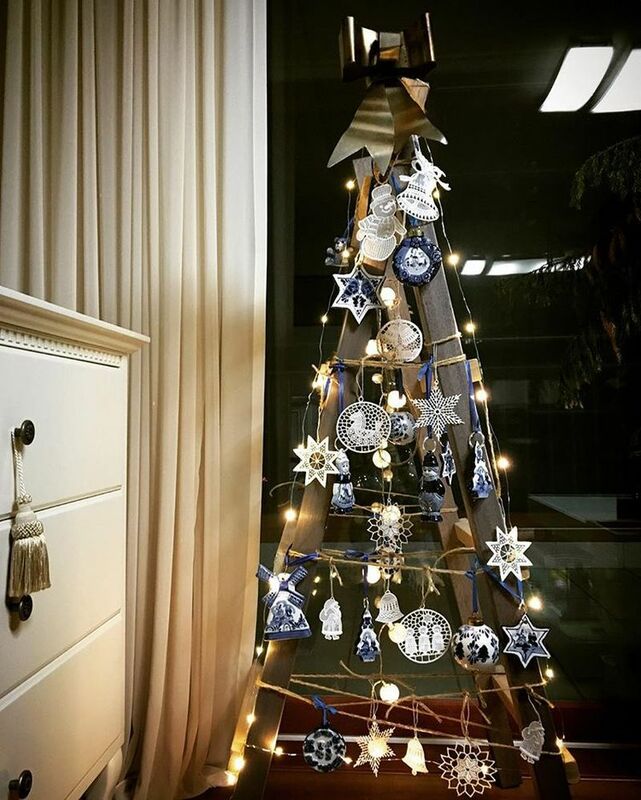 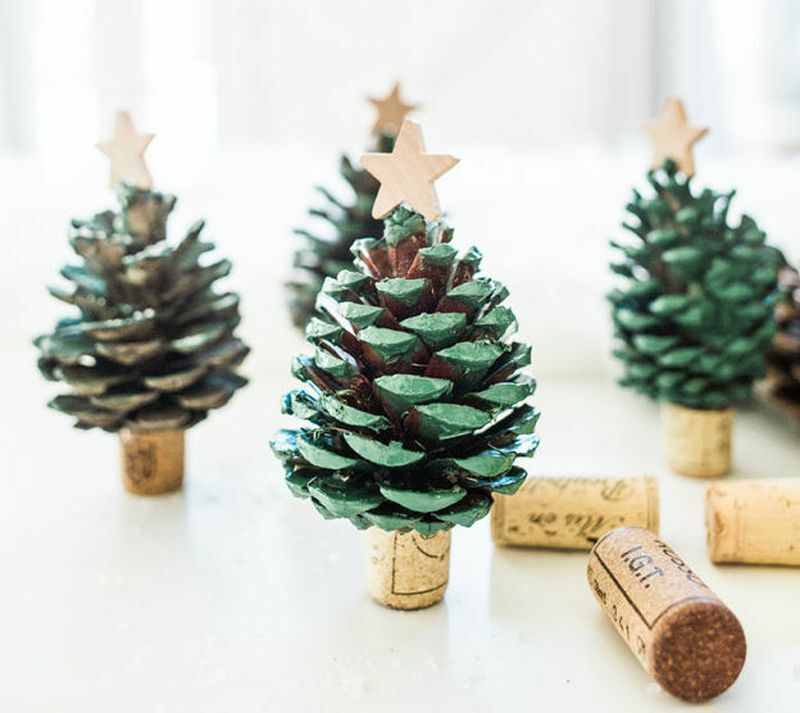 If you want to try something different this year, there are a variety of ways to make alternative Christmas trees, which can be used to add a festive touch to your home decor. 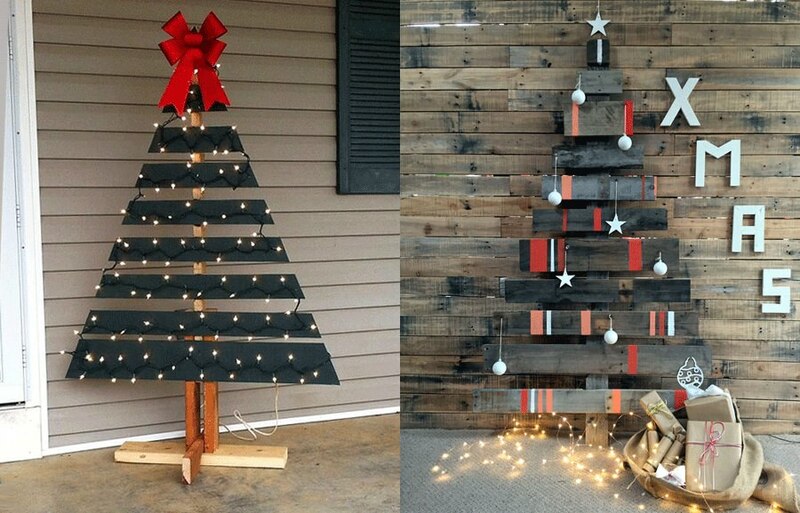 Read below for 20+ best Christmas tree alternatives that are easy to make and ideal to meet your fascination. 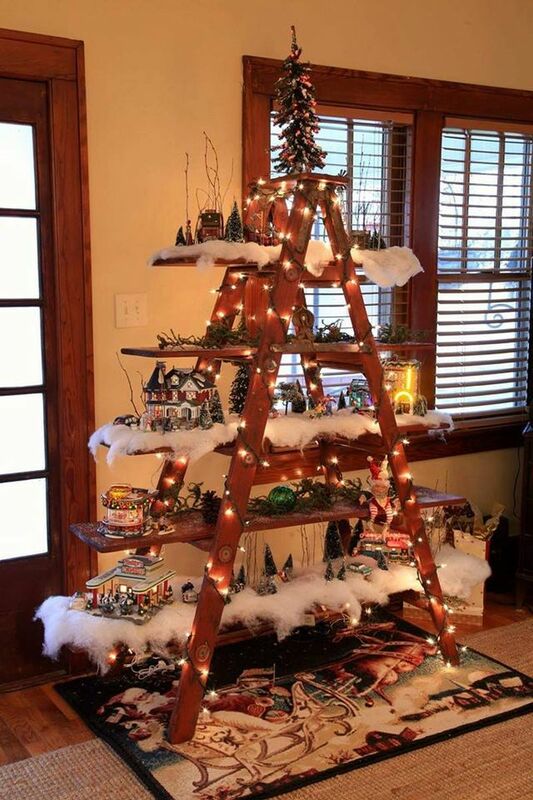 You probably have heard and seen ladder Christmas trees. 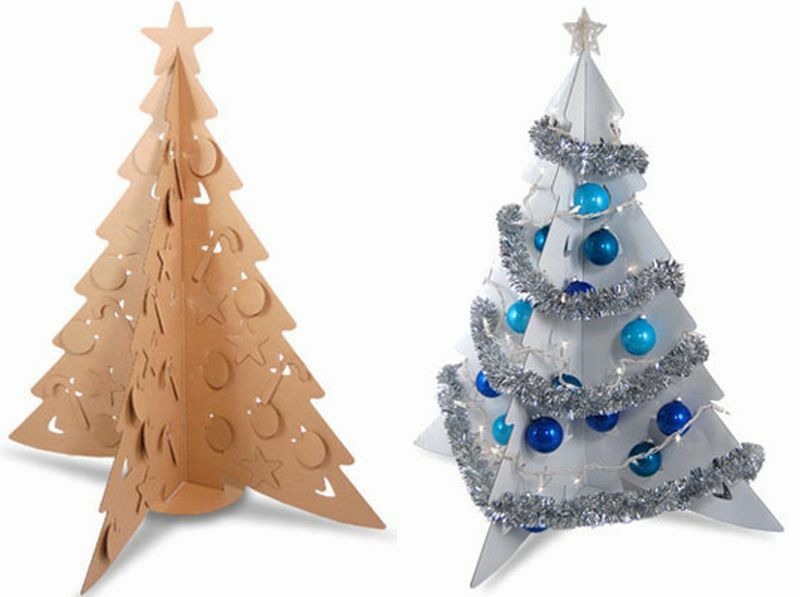 They are perfect Christmas tree alternatives for people who like to decorate home in an eco-friendly and minimalist manner. 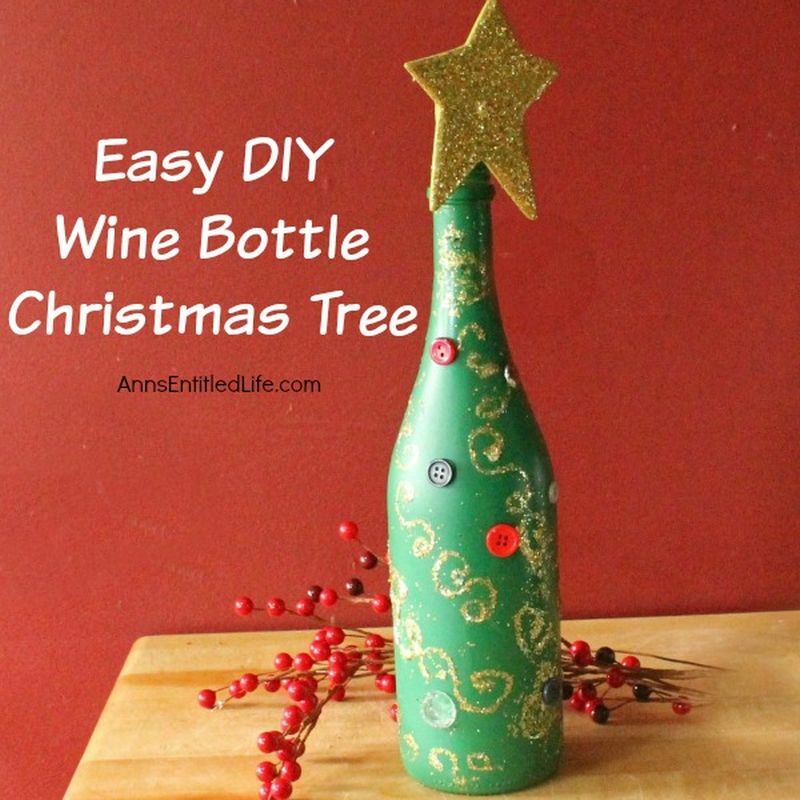 Why not make one for yourself this year? 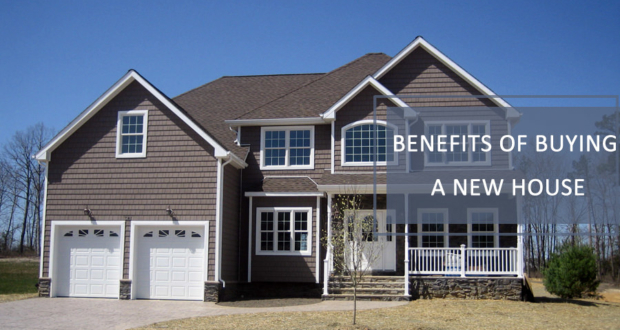 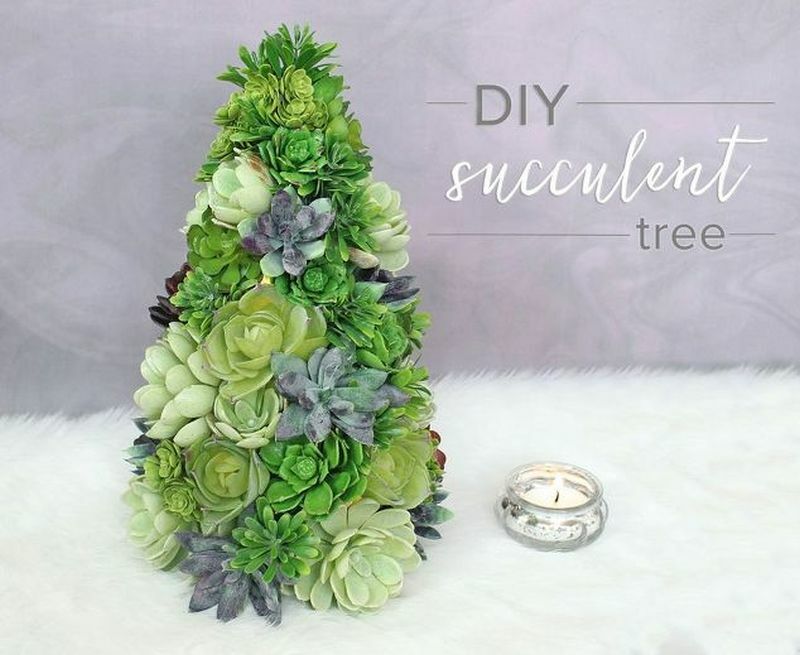 It is a budget-friendly, and easy DIY that’s going to attract everyone’s attention. 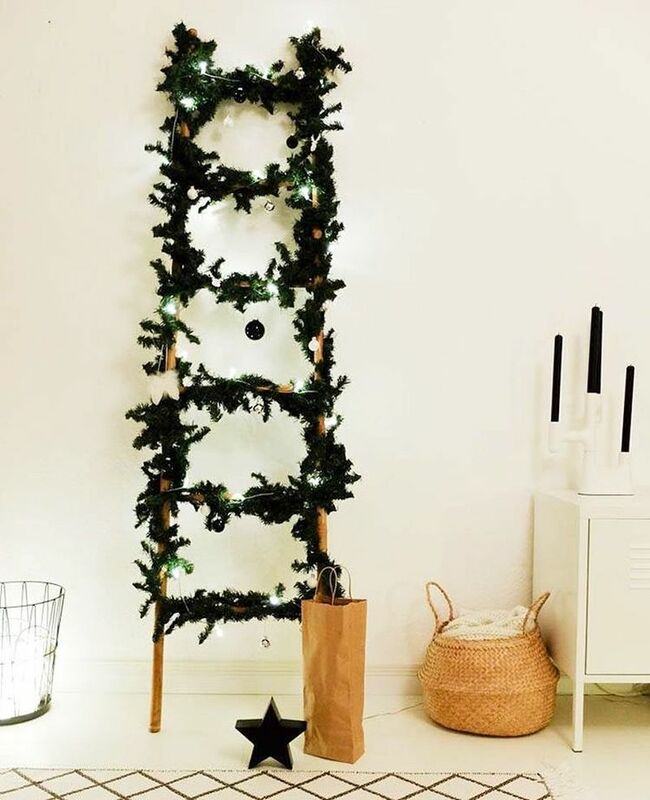 Whether decorating with light strips or Christmas tree ornaments, there is a plenty of scope to showcase your creativity with the ladder Christmas tree. 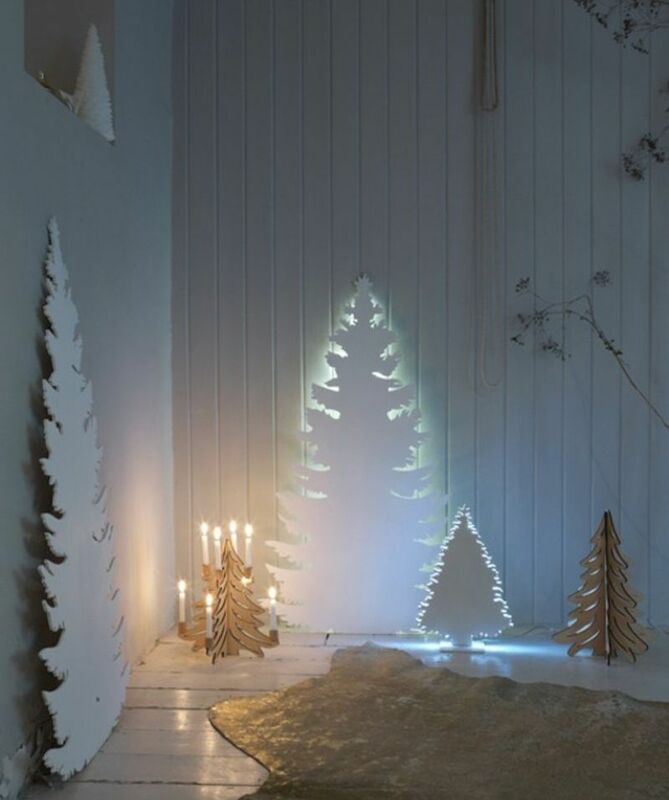 See below some ideas for inspiration. 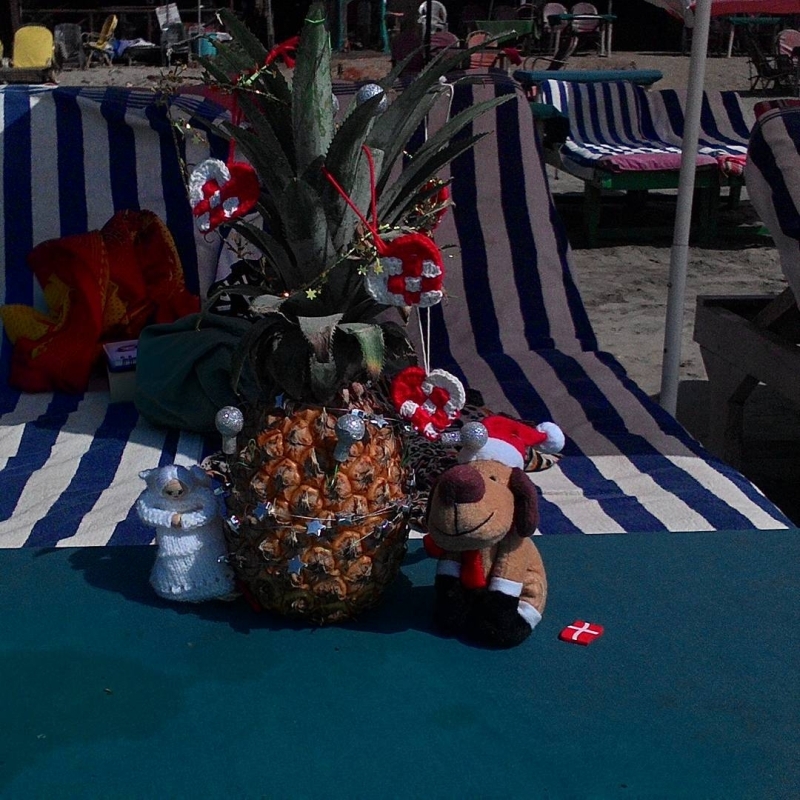 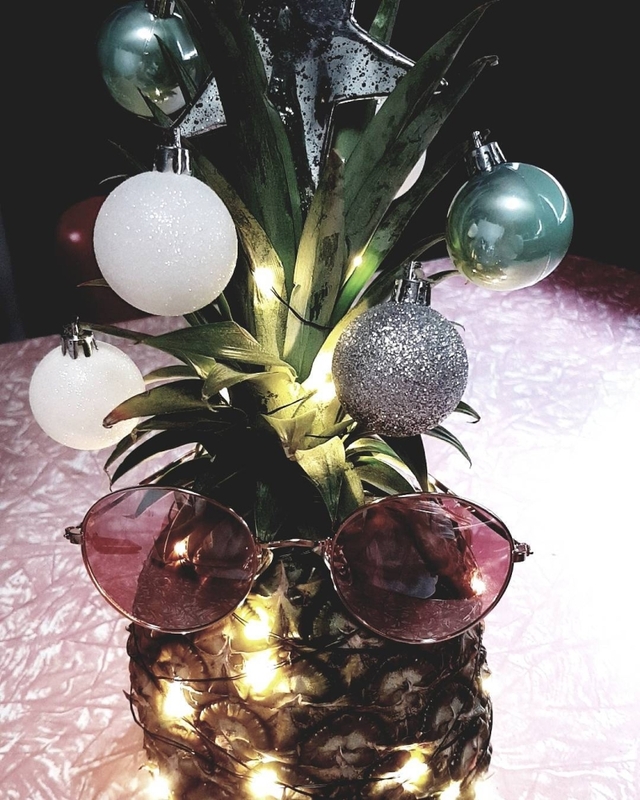 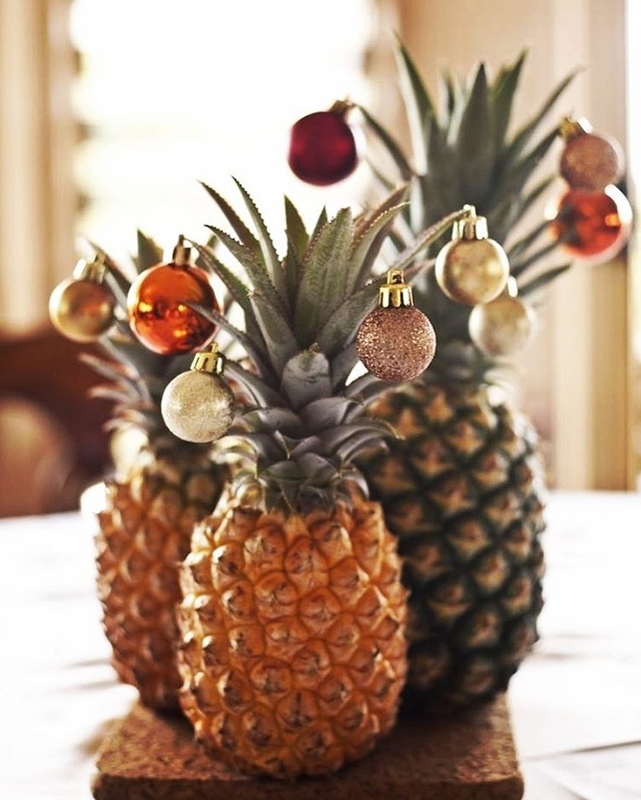 If you don’t have much time on you, you can make a simple and cute Christmas tree using a pineapple. 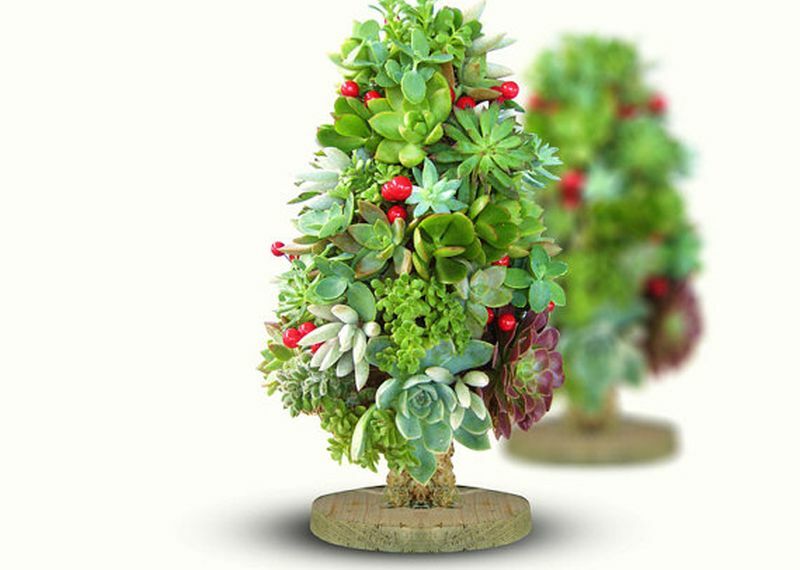 It is not only a very budget-friendly idea but will also look attractive on a shelf or table. 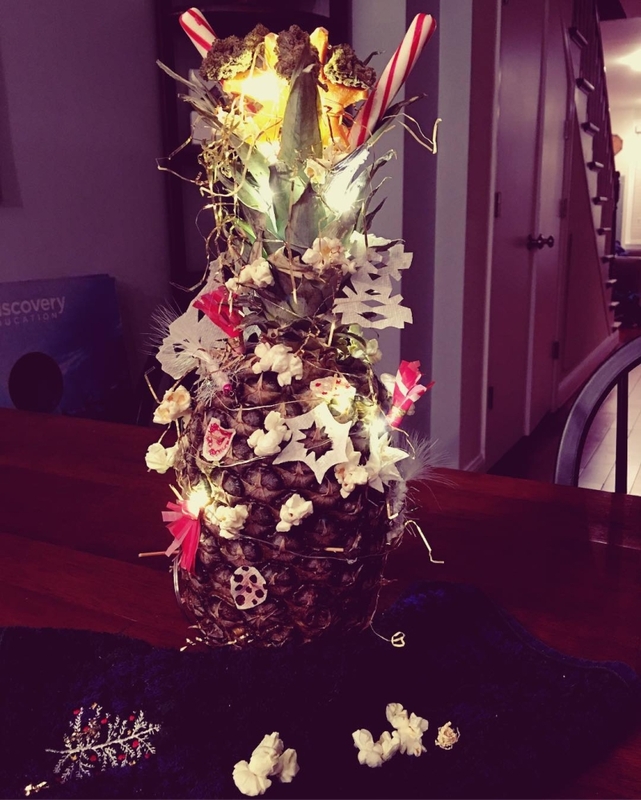 Making one is super easy: all you have to do is, decorate a fresh pineapple with embellishments and festive lights. 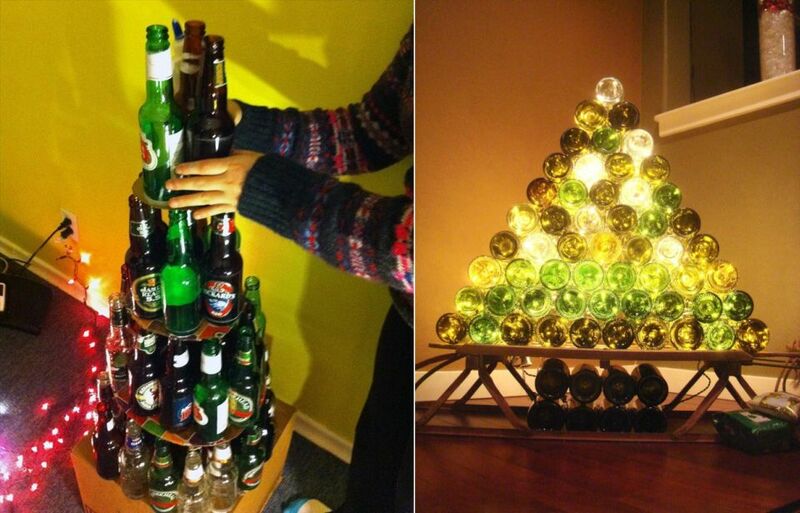 In the end, it boils down to your creativity – how innovative you can be with the lighting and decor. 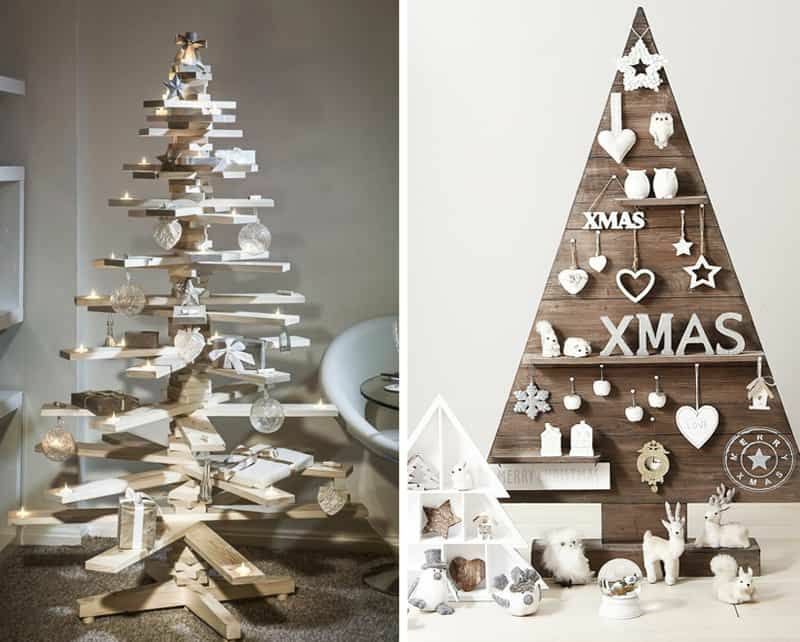 Below are some ideas for inspiration. 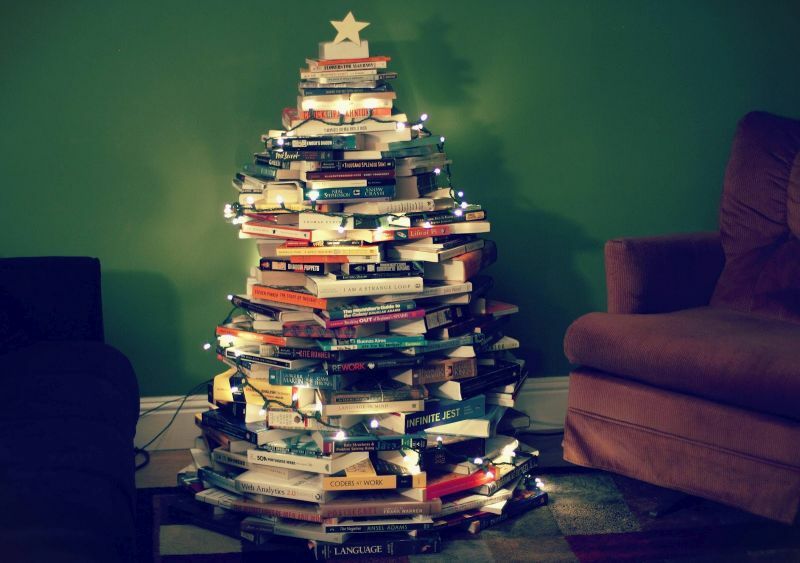 Don’t let your collection of books bite the dust. 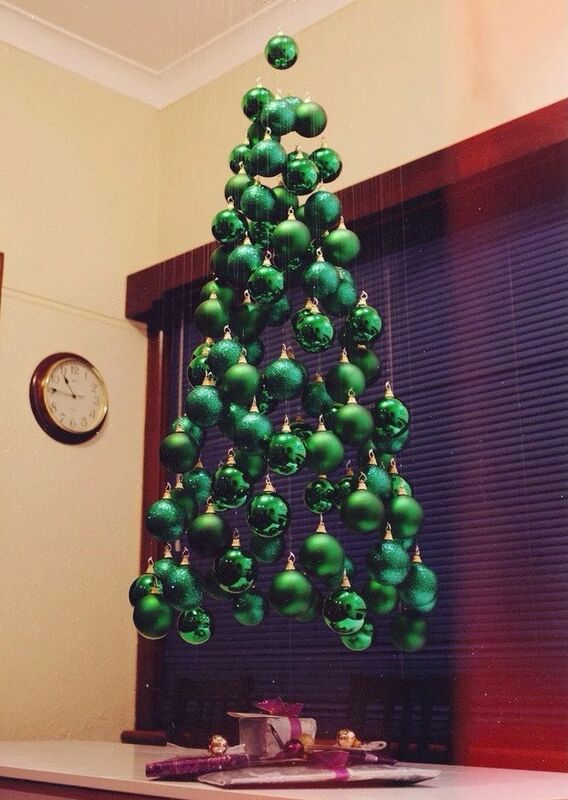 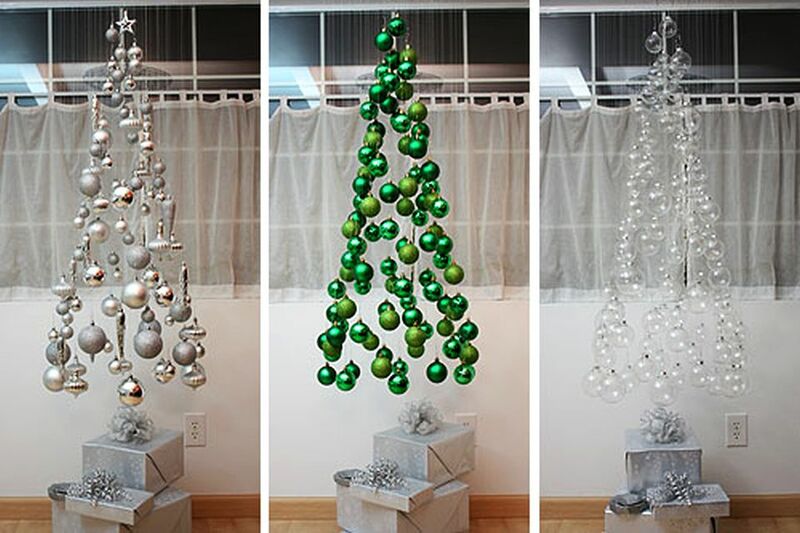 You have a good option of using them to make an elegant Christmas tree. 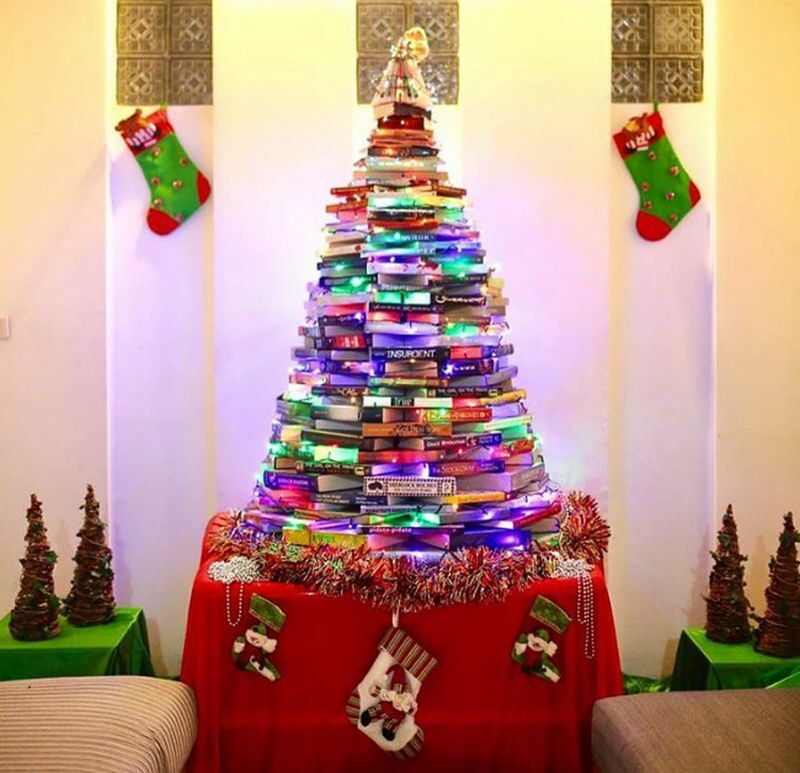 It will be a bibliophile’s dream come true. 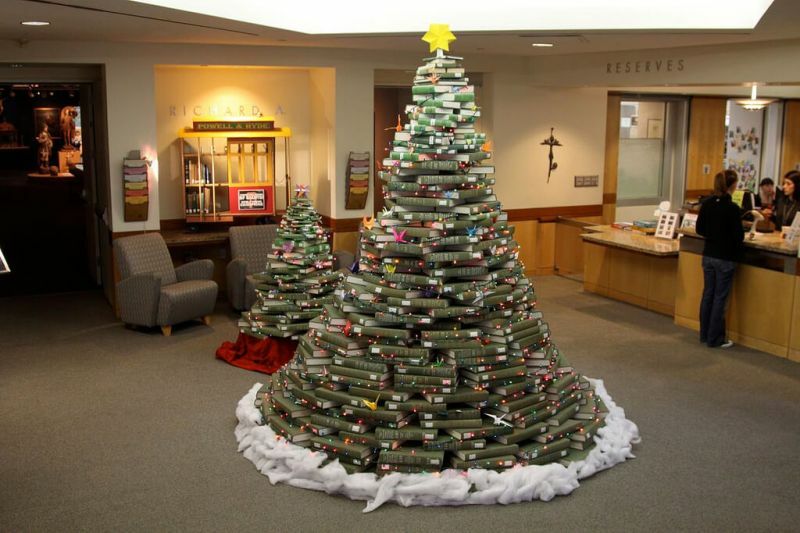 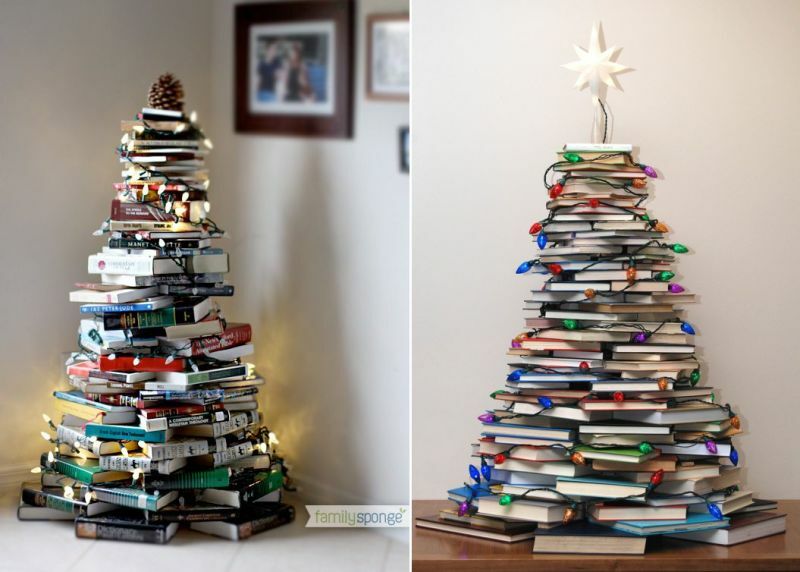 You just need to stack the books in a manner to look like a Christmas tree and decorate it with desired Christmas tree decorations. 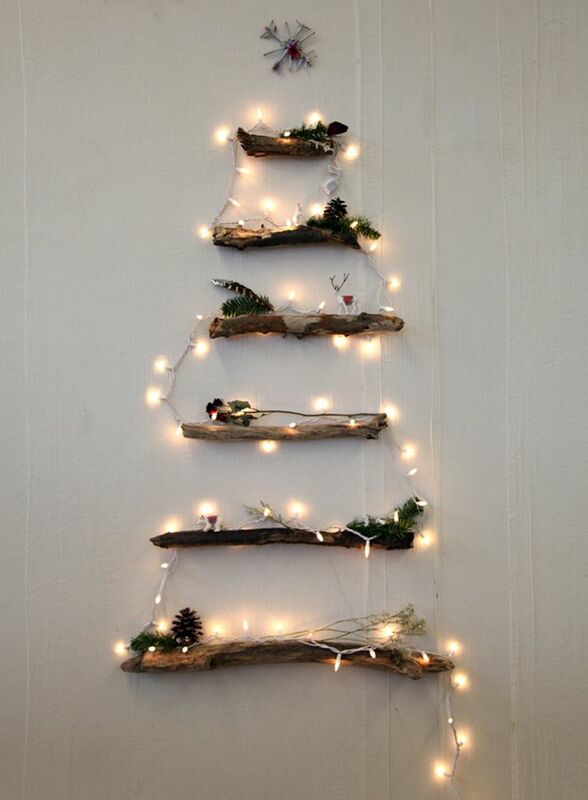 See below some ideas for inspiration. 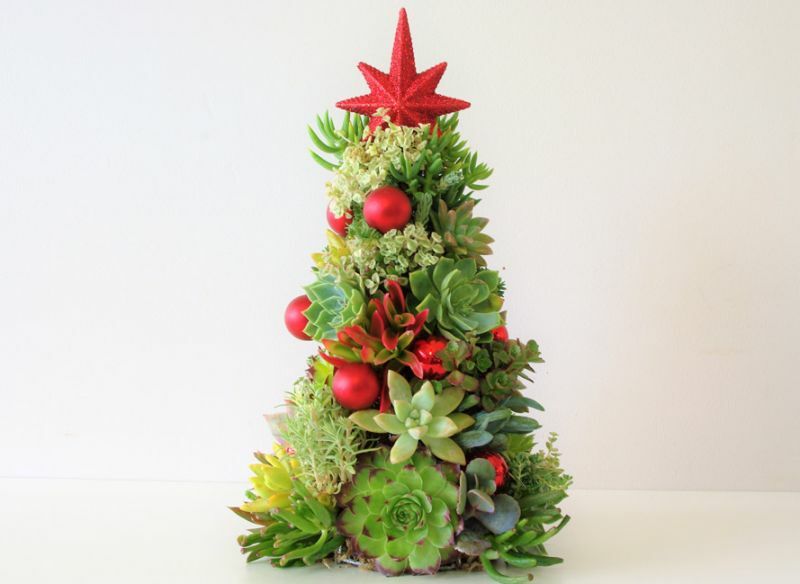 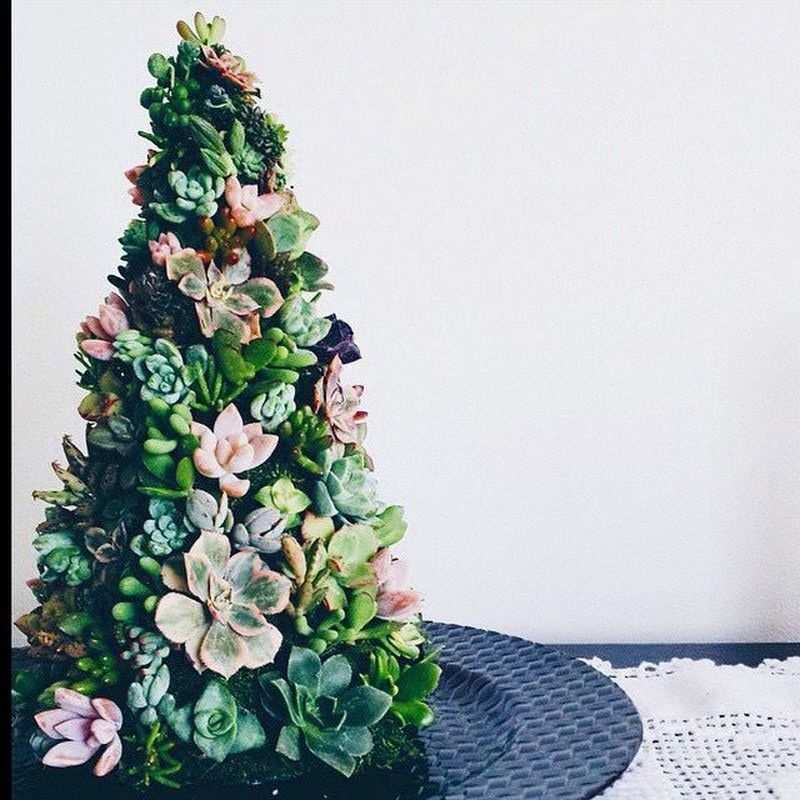 If you’re lucky to have succulent plants in your garden, then make your decoration unique with a succulent Christmas tree. 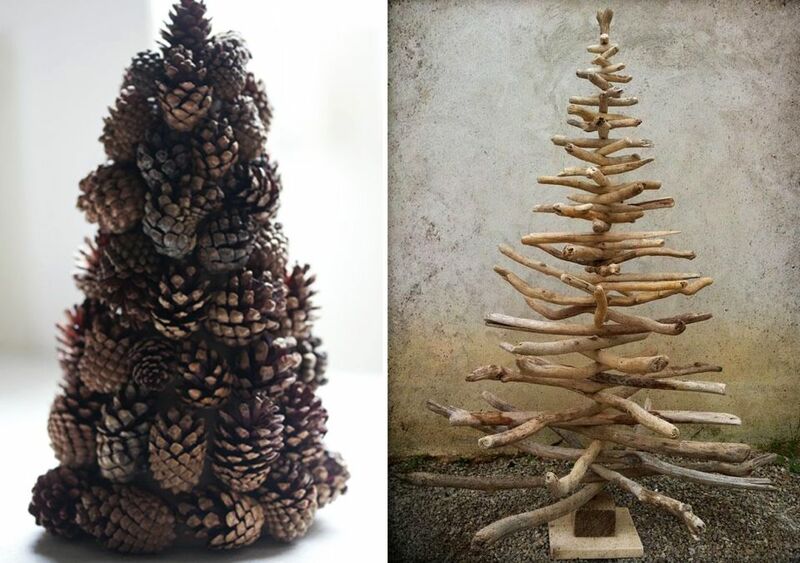 Whether you place them on a table, or on a shelf, these nature-inspired Christmas trees look beautiful. 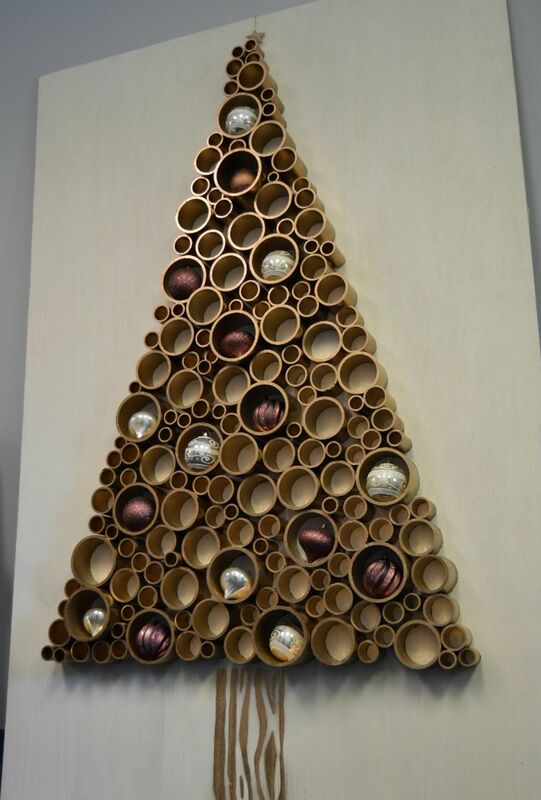 You can even make large ones but they will require a lot of time and space for sure. 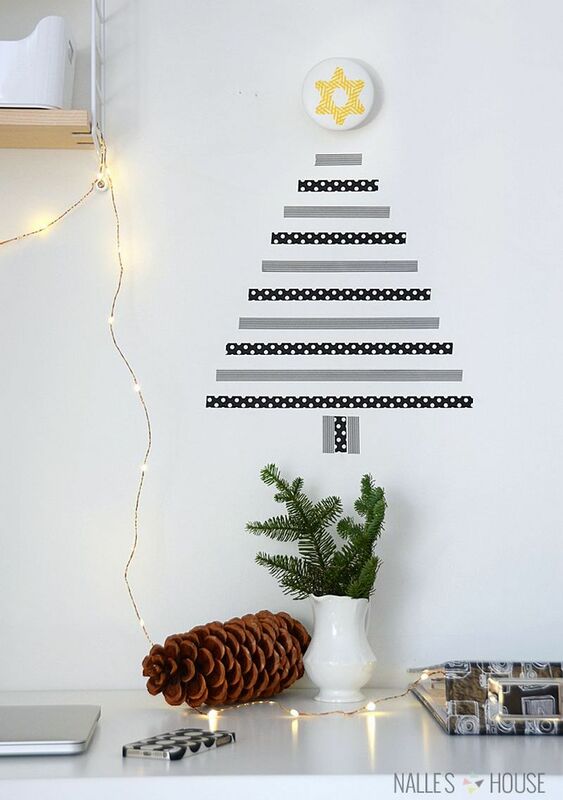 Scroll down for ideas. 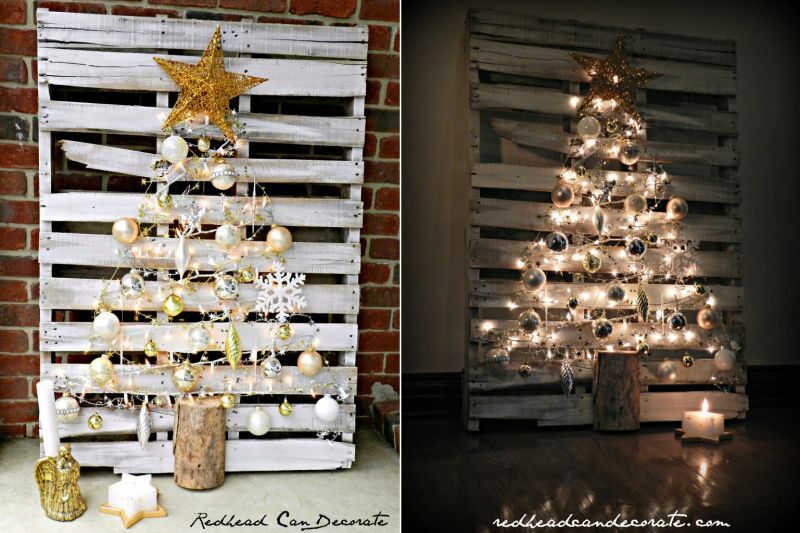 Add a purpose to your Christmas celebration by repurposing pallet wood that you’ve crammed up in your storeroom since ages. 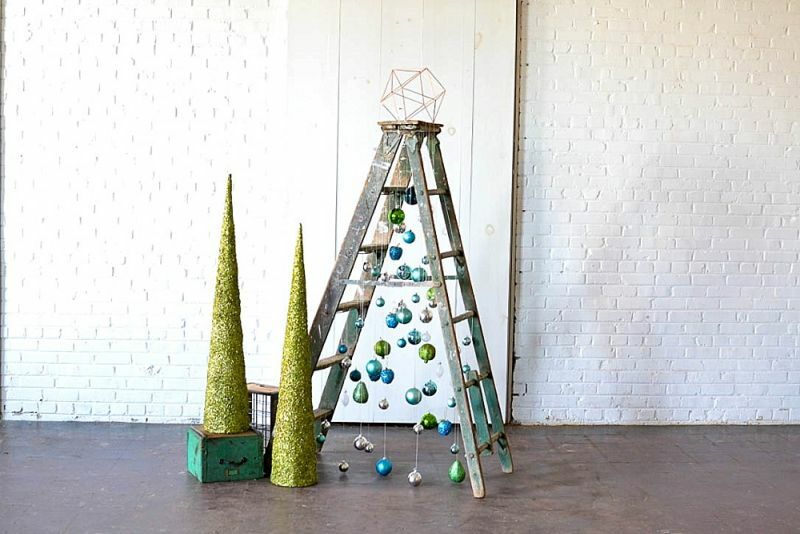 You can transform unused pallets into a unique Christmas tree that will look great on the front porch. 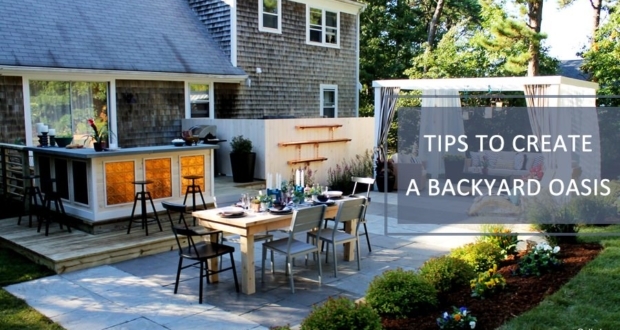 Below are some ideas to draw inspiration. 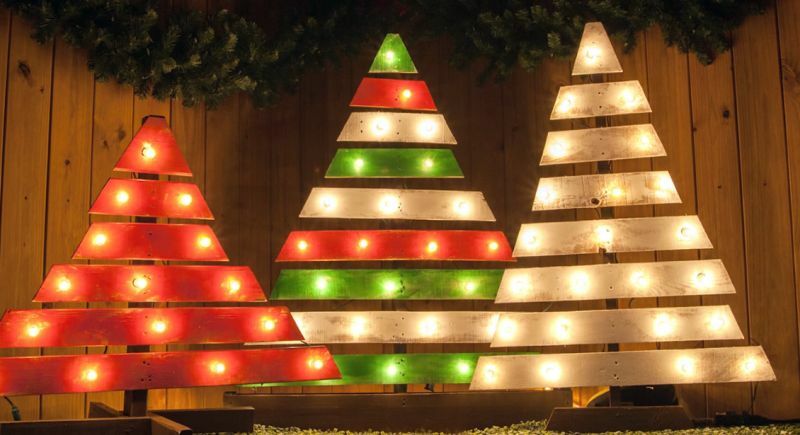 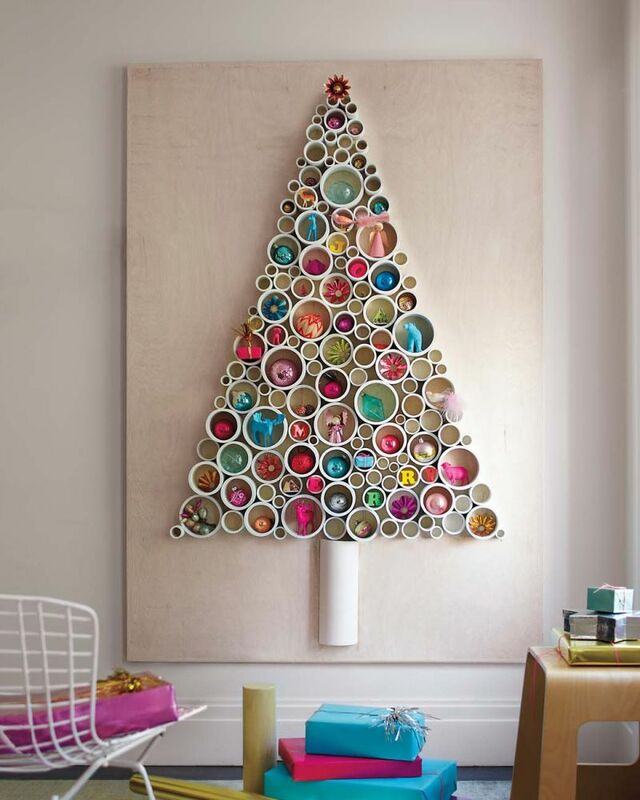 Have a look at these (below) Christmas trees made from PVC pipes. 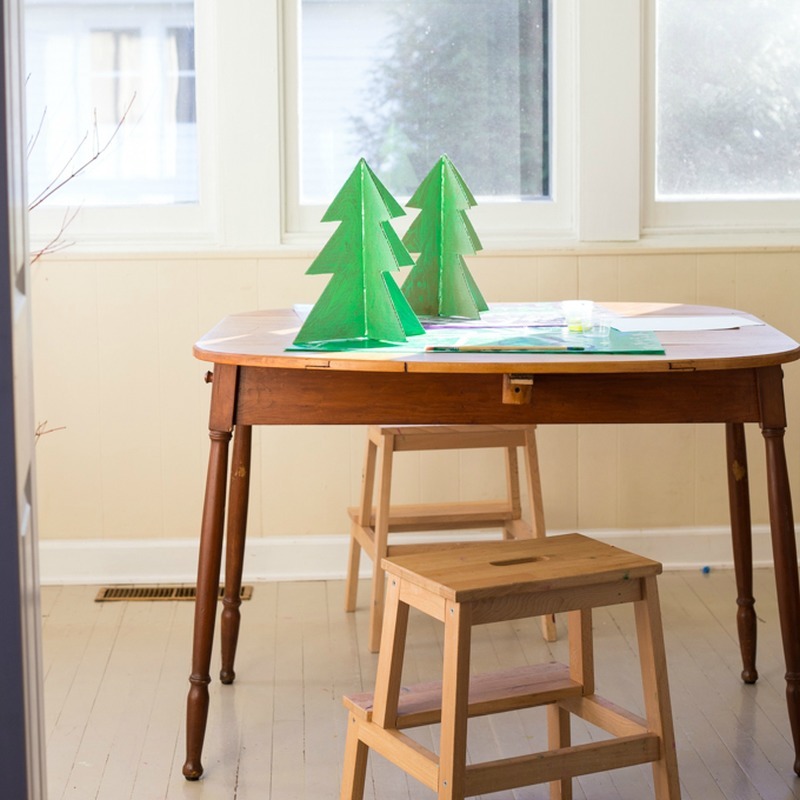 They are a perfect idea for confined spaces or apartments, where space-saving decor is a must. 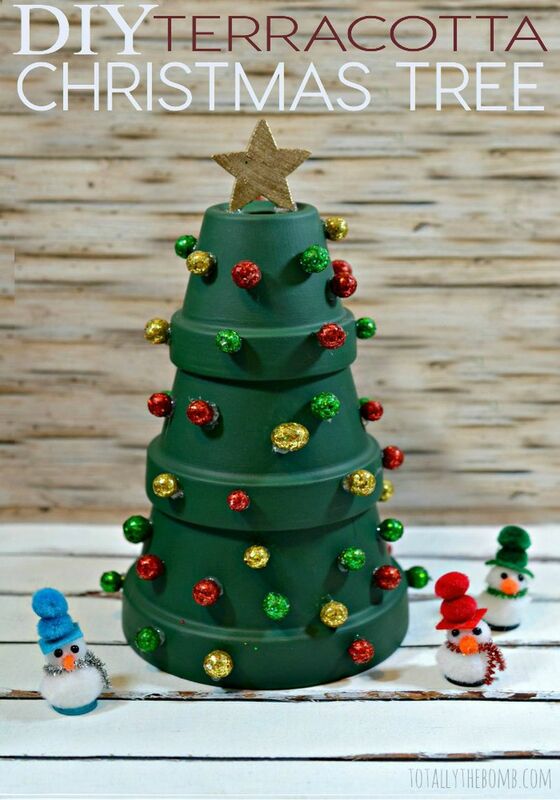 PVC pipe Christmas tree add a unique touch to the interior and don’t take much time or effort to make. 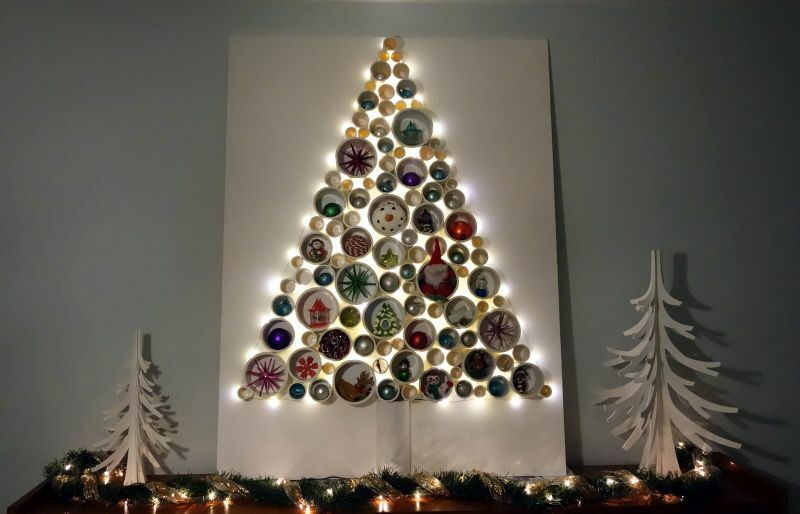 You just need to cut PVC pipes into pieces, stick them together to form a tree pattern on a flat panel and decorate it with your favorite ornaments. 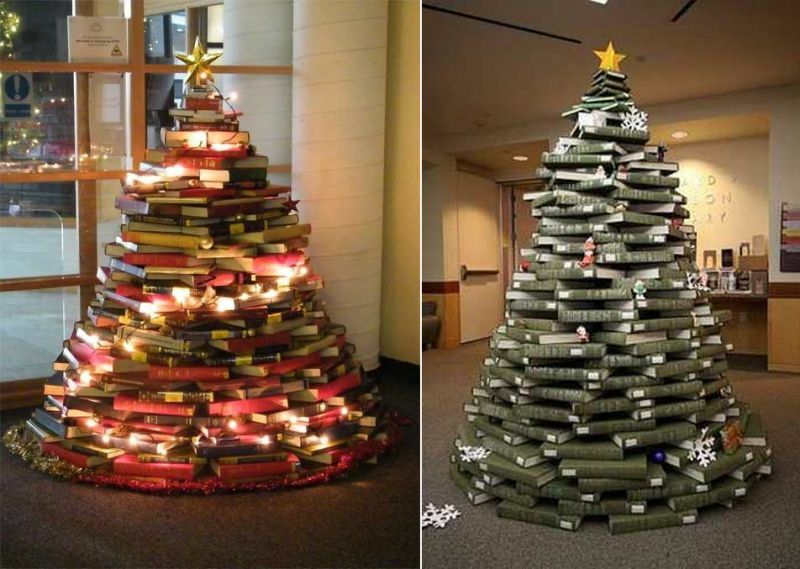 See below some ideas for inspiration. 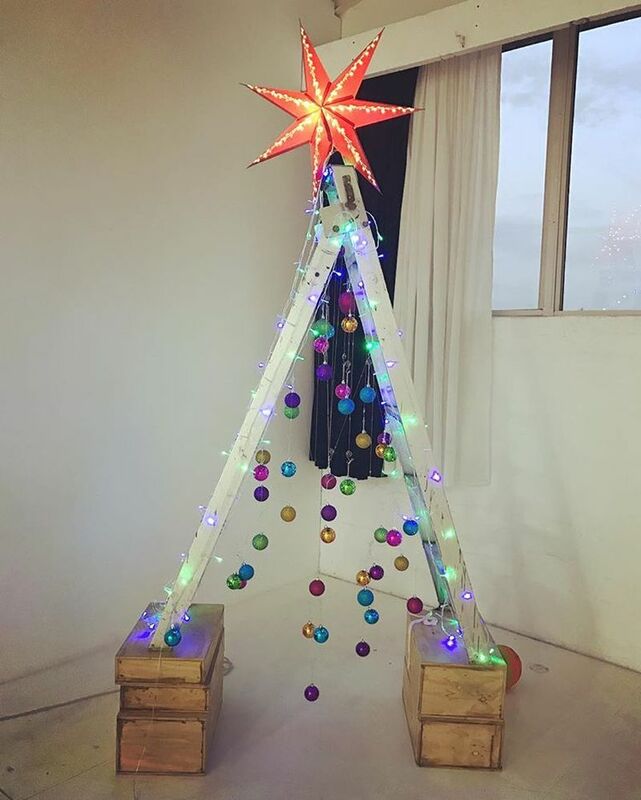 For this DIY Christmas tree, collect some fallen tree branches, and tie them up in the shape of a tree. 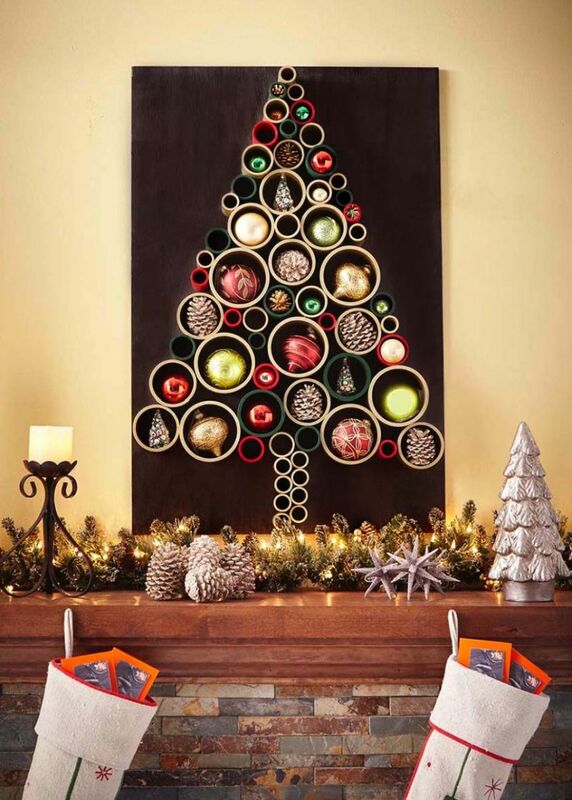 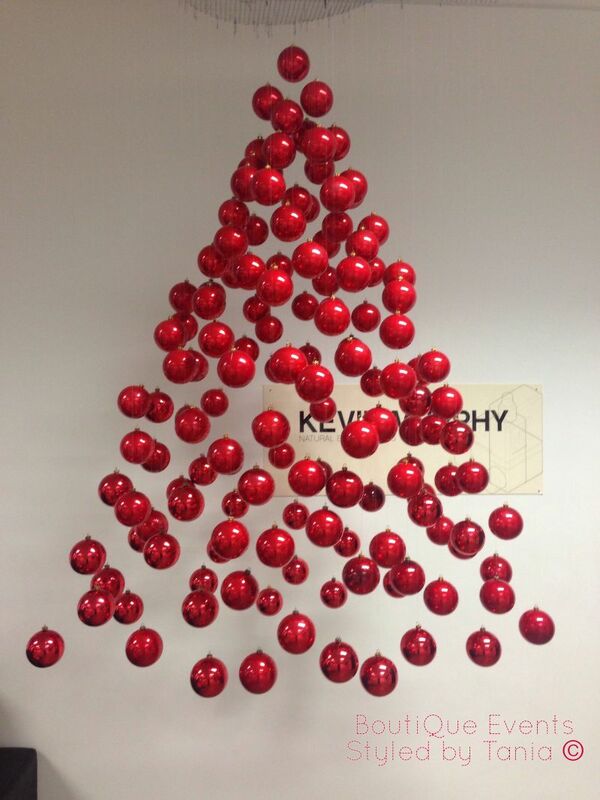 Hang it on a wall and decorate with Christmas balls and stars to render a mesmerizing look. 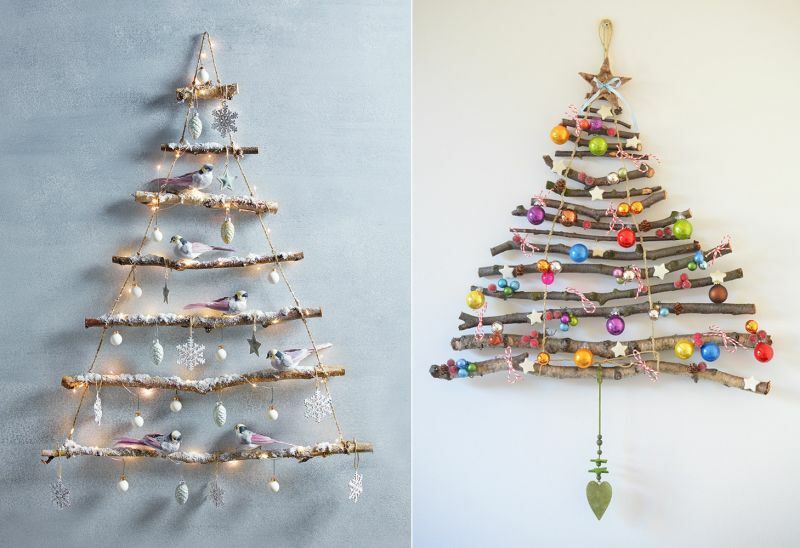 This way you are making a good use of tree branches, which otherwise will land in a fire pit or be stranded without any practical use. 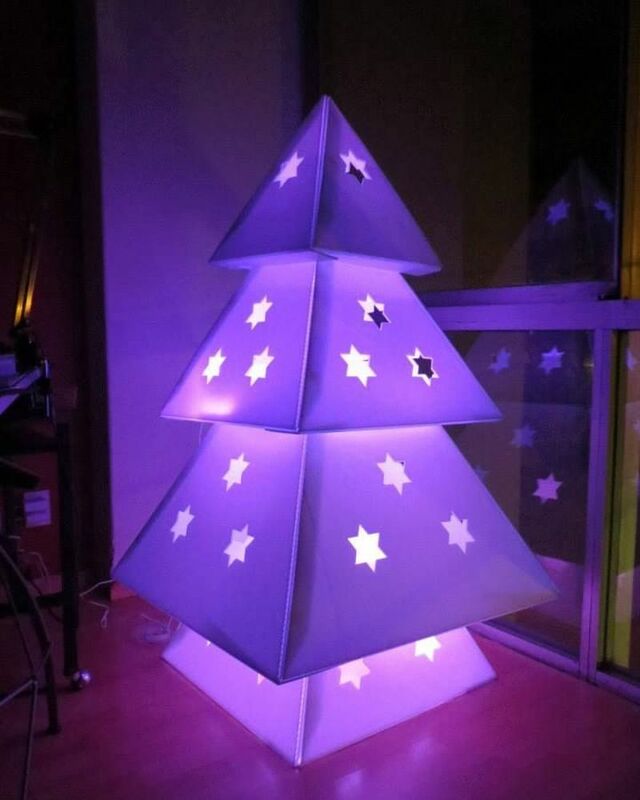 Have a look at some ideas below. 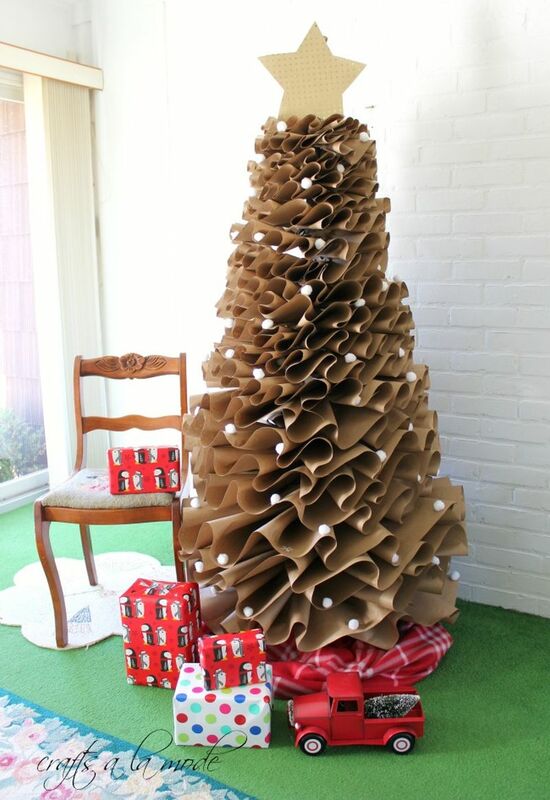 Do not throw away the cardboard boxes you’ve got with your newly bought refrigerator, washing machine or TV. 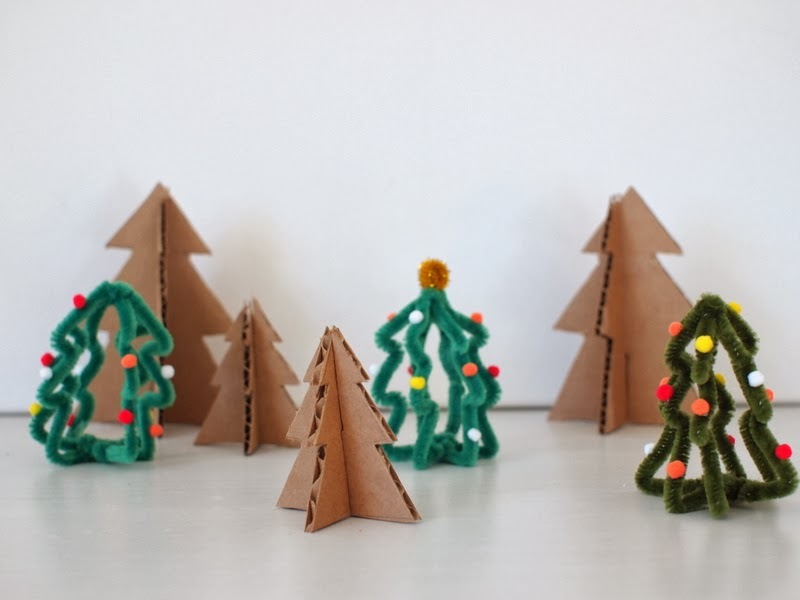 Save them up and make a Christmas tree with the help of your little ones. 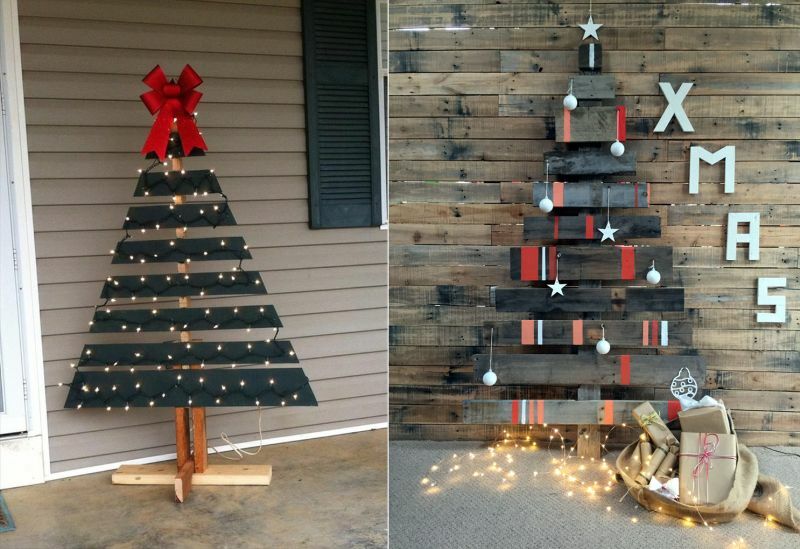 Take some inspiration from the ideas below. 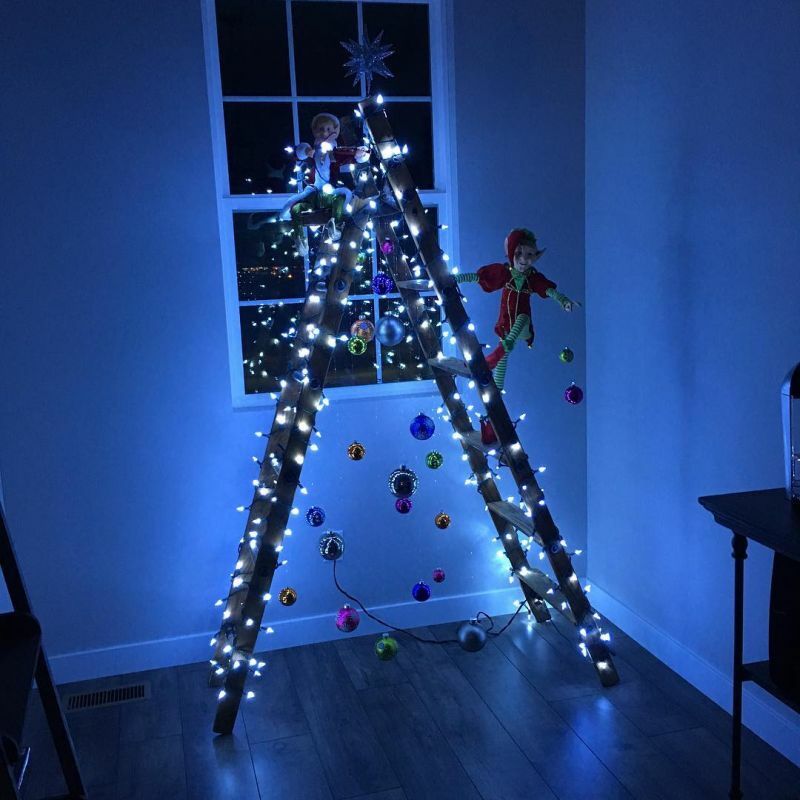 Happy building! 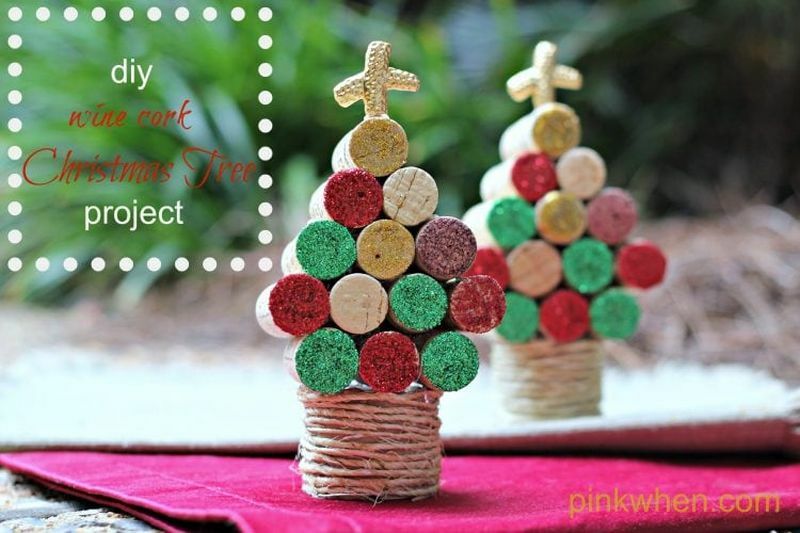 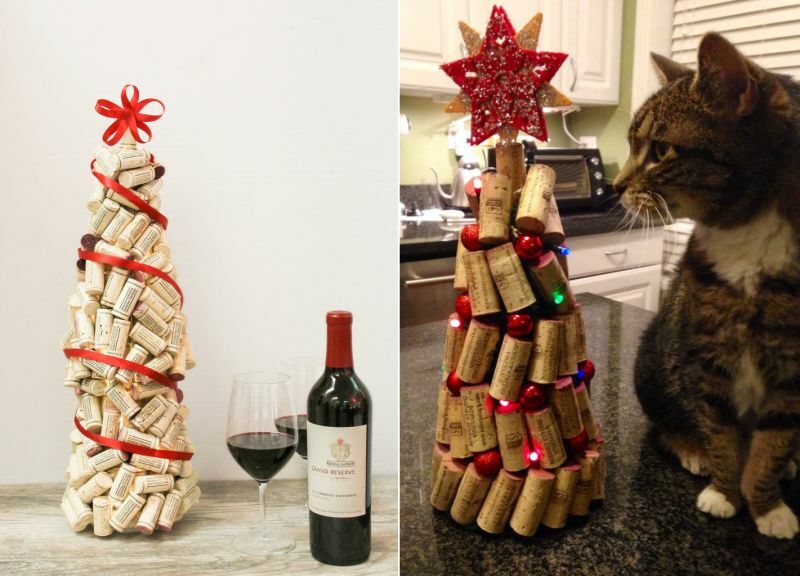 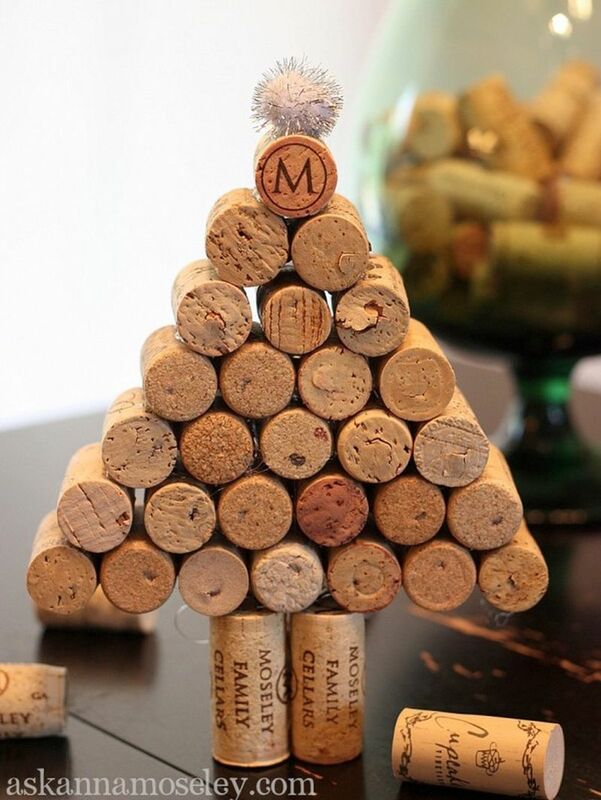 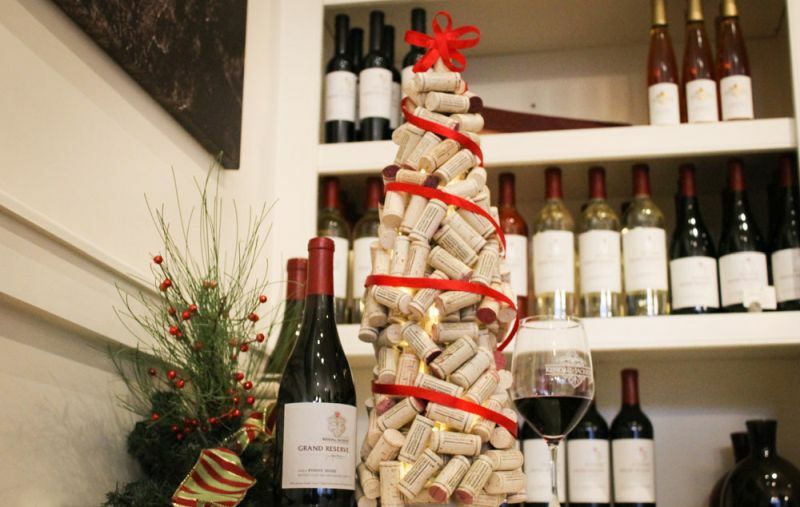 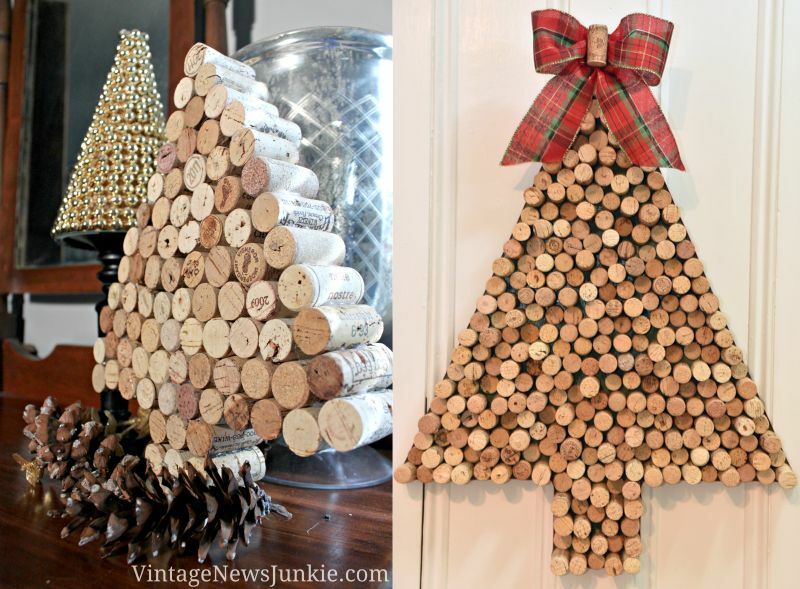 You can make a whimsical tabletop Christmas tree using unused wine corks. 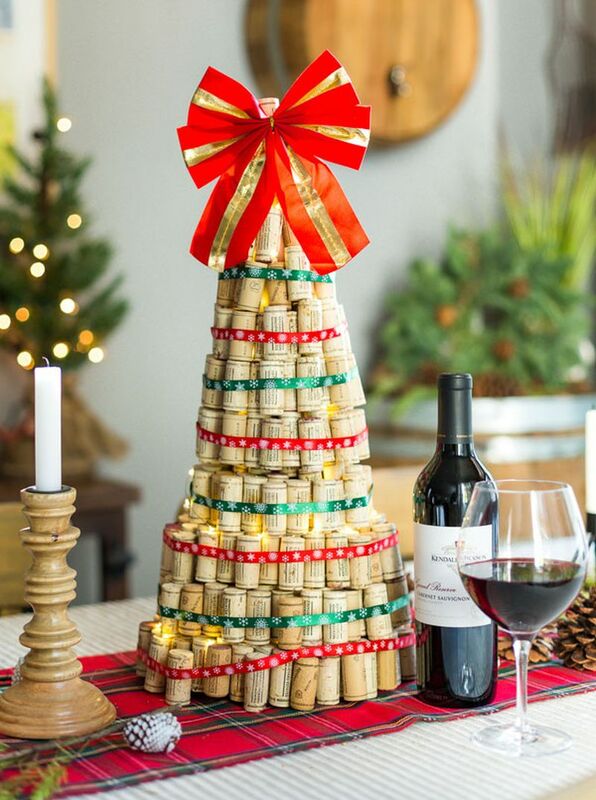 Start with gluing up corks in an upright position around a Styrofoam cone, leaving small gaps between each cork for battery-powered lights. 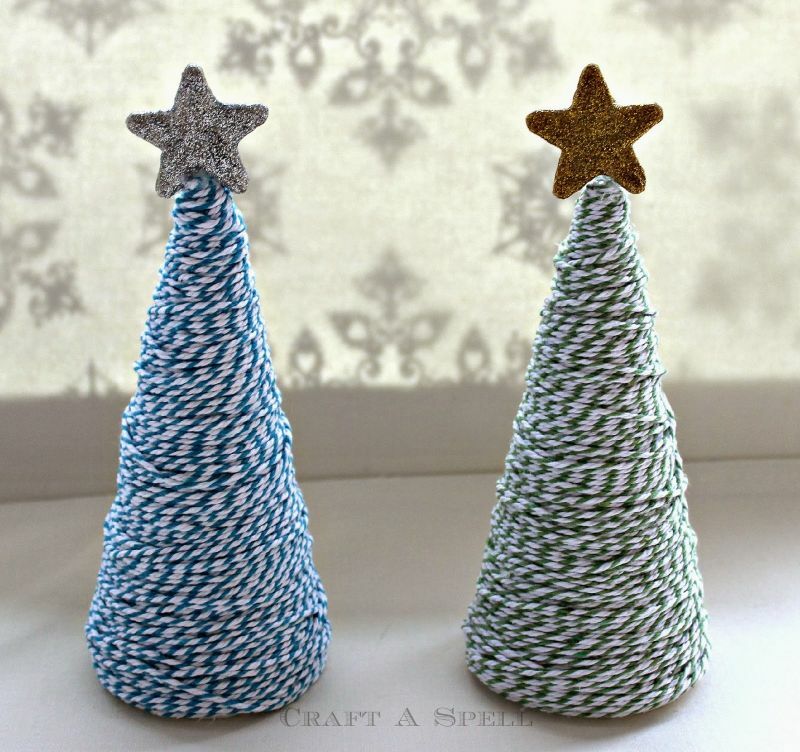 Decorate with a bow, star, or other small ornaments of your choice and there, your tree is ready. 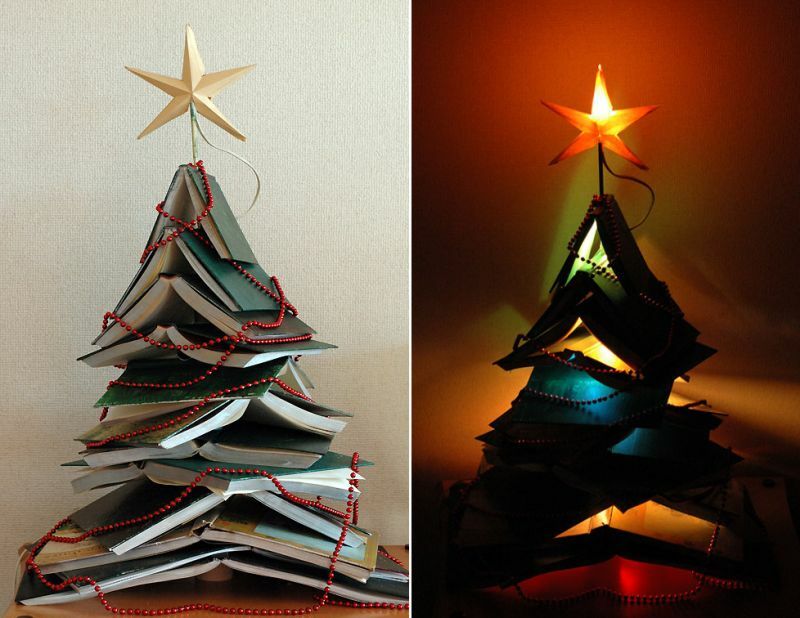 See below some ideas for inspiration. 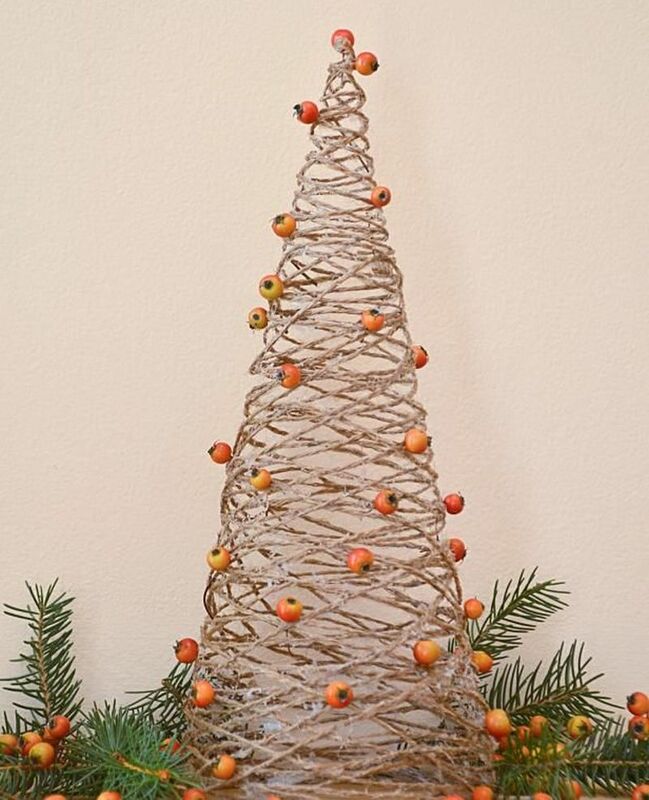 Weave together shiny Christmas tree ornaments of same or different colors and suspend using thin threads. 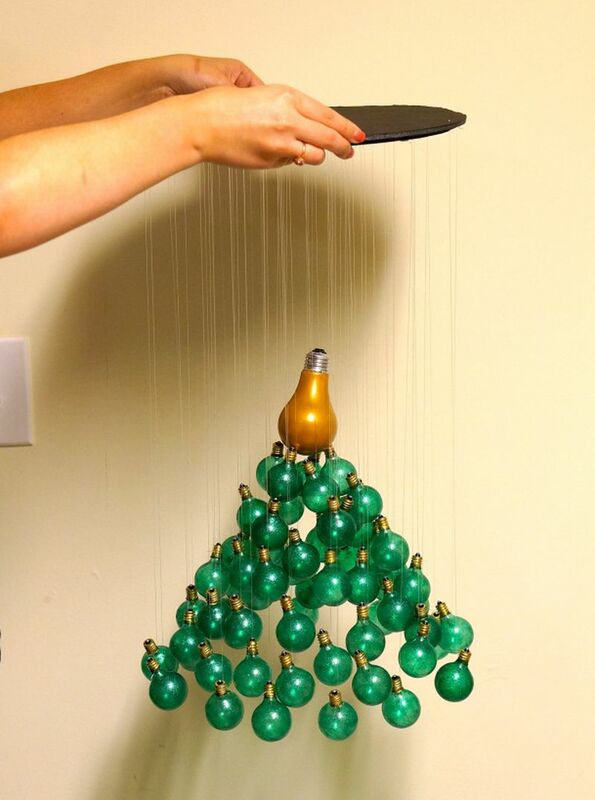 Use green ornaments if you want to get a reflection of a natural tree. 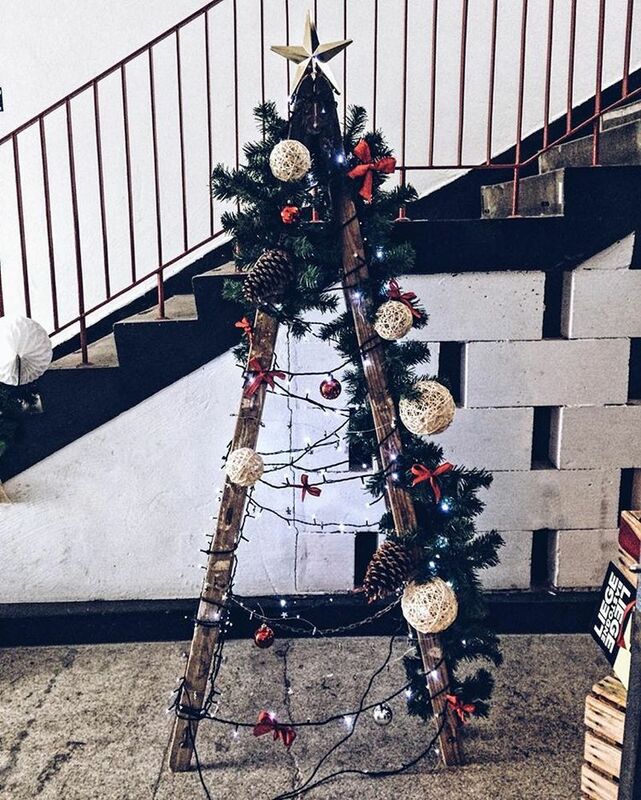 You can hang this unusual Christmas tree at any central location within the living room. 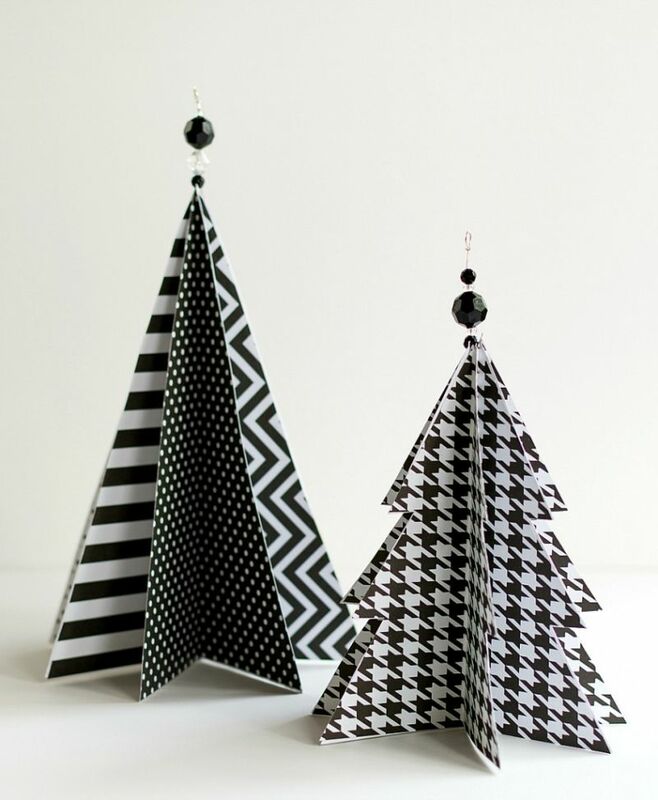 See below some Christmas tree mobiles you’d love. 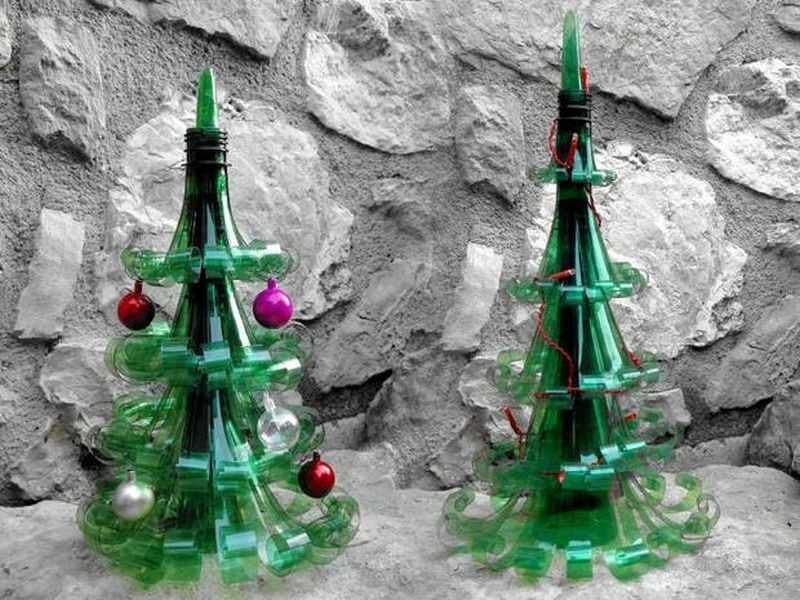 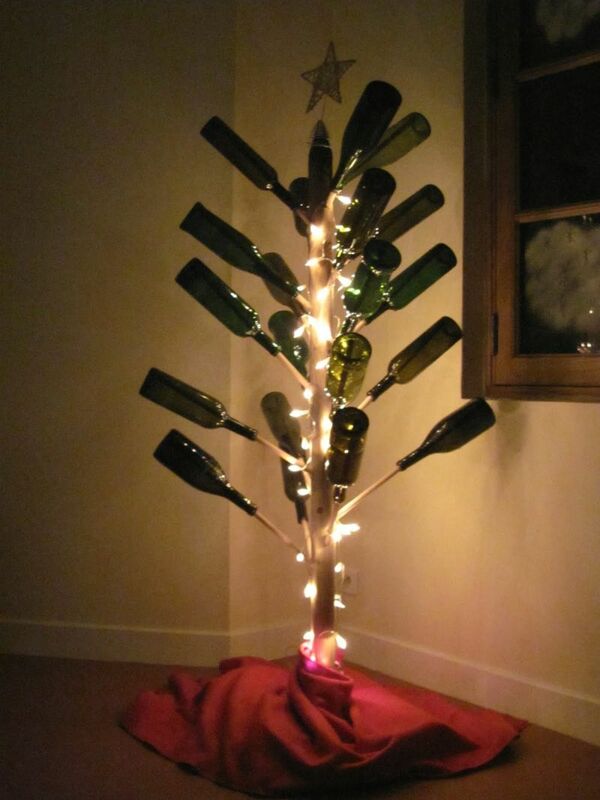 Collect all empty unused glass bottles at home and give them a second life by turning them into a one-of-a-kind Christmas tree. 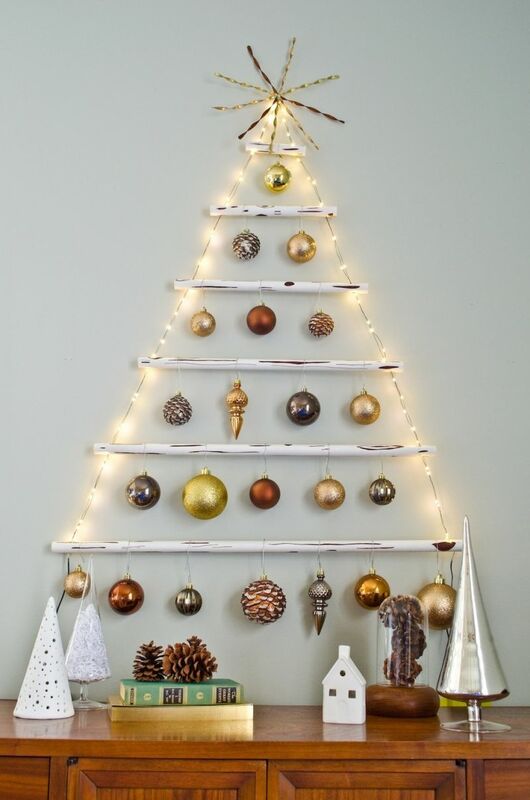 You need to stack them up, one over the other, vertically or horizontally to form a tree-like structure. 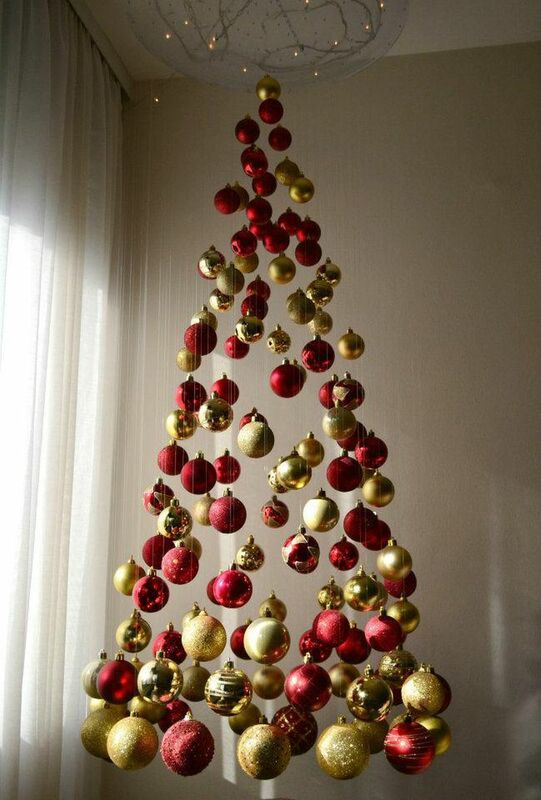 It can be decked with light strings and other ornaments. 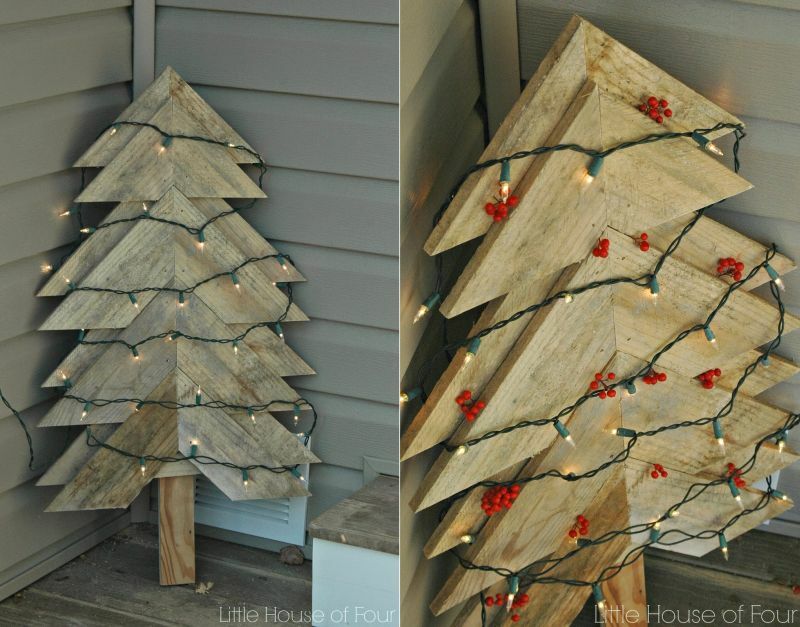 Some ideas for inspiration below. 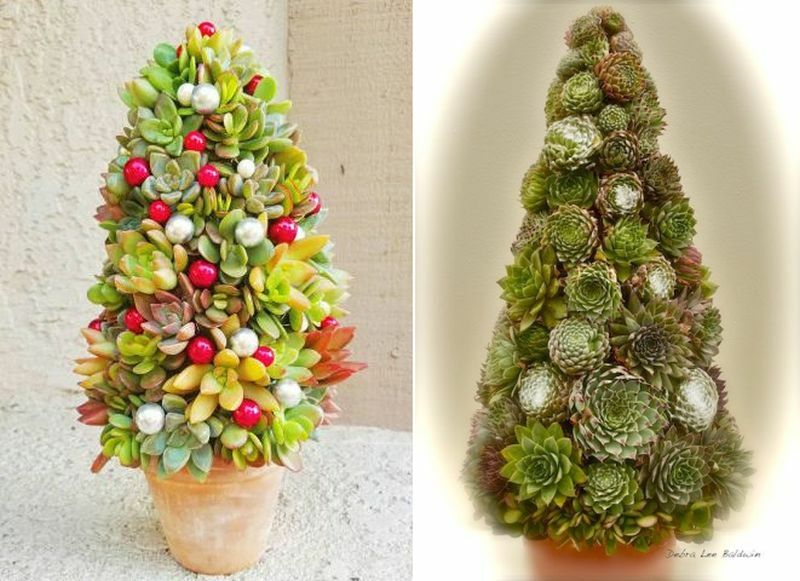 If you don’t like vibrant colors around you, but want something simple yet unique for Christmas; nothing better than staying natural. 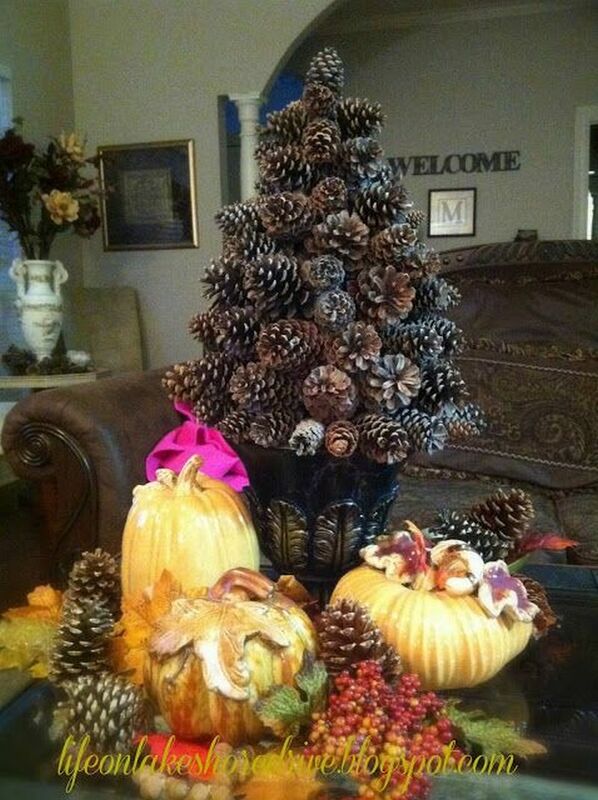 In simple words, you can use natural elements to decorate your home for the day. 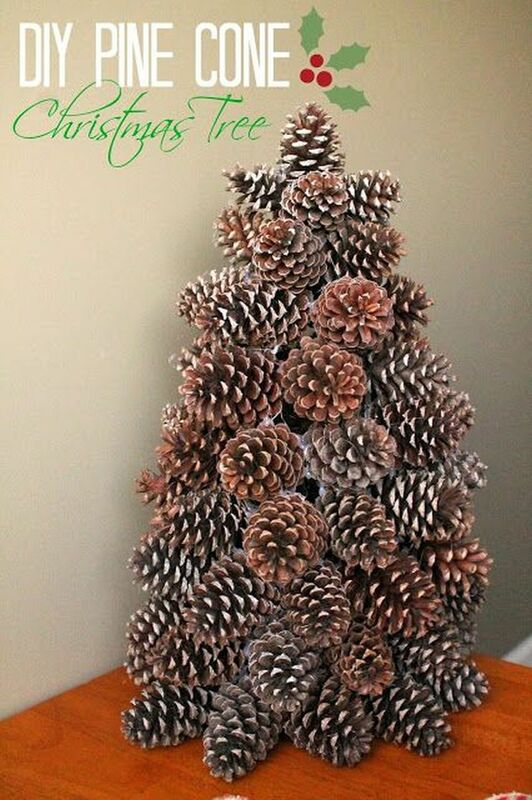 One cool idea is to make use of pine cones and dry tree branches to form dry DIY Christmas tree. 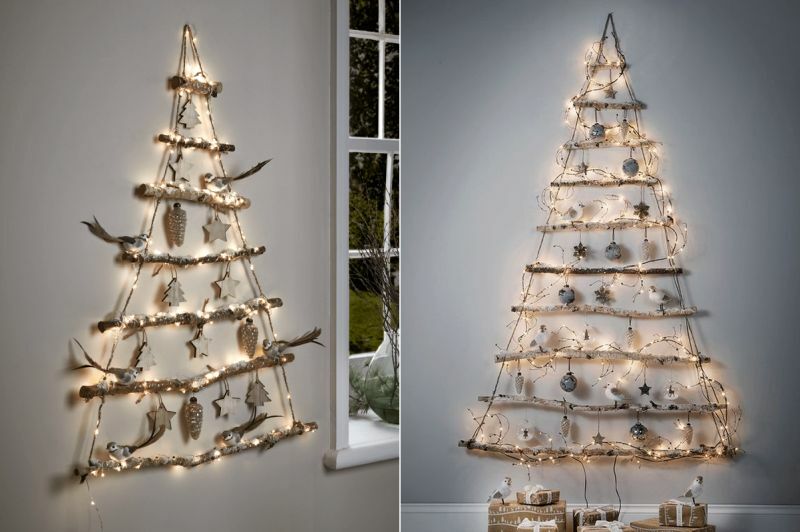 It can be embellished with lights or decorative objects, if you may, else they look equally impressive all bland. 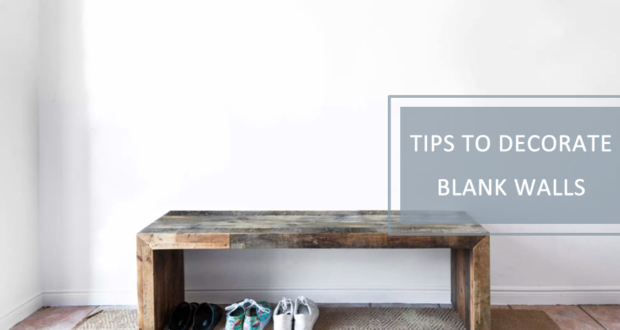 If you doubt, see some ideas below and get inspired. 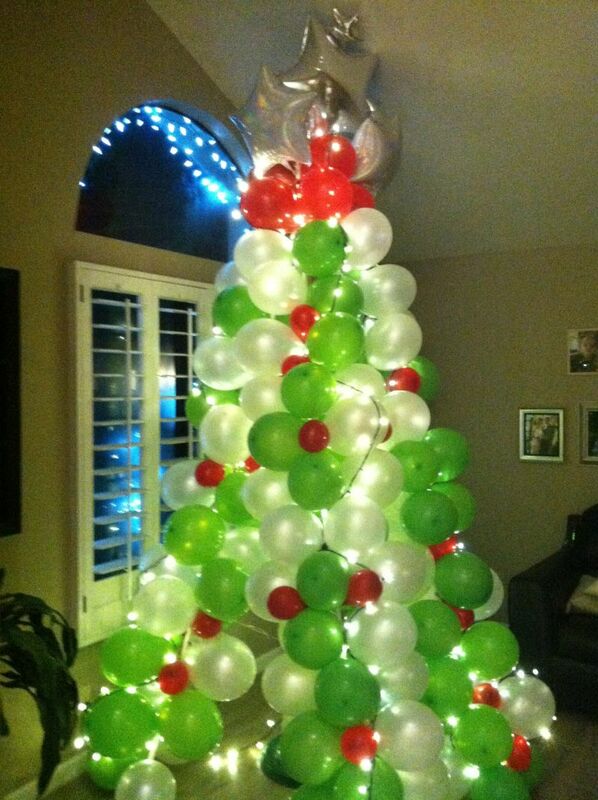 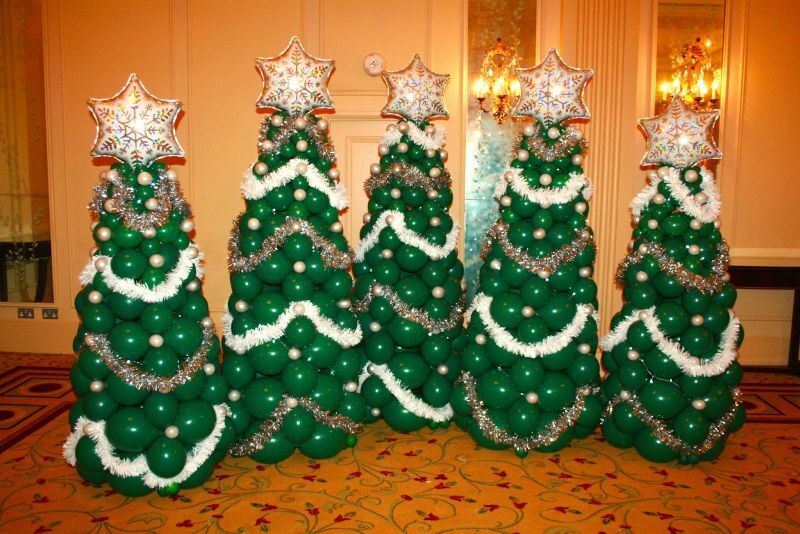 Take home green, white and red balloons from a craft store to create a balloon Christmas tree. 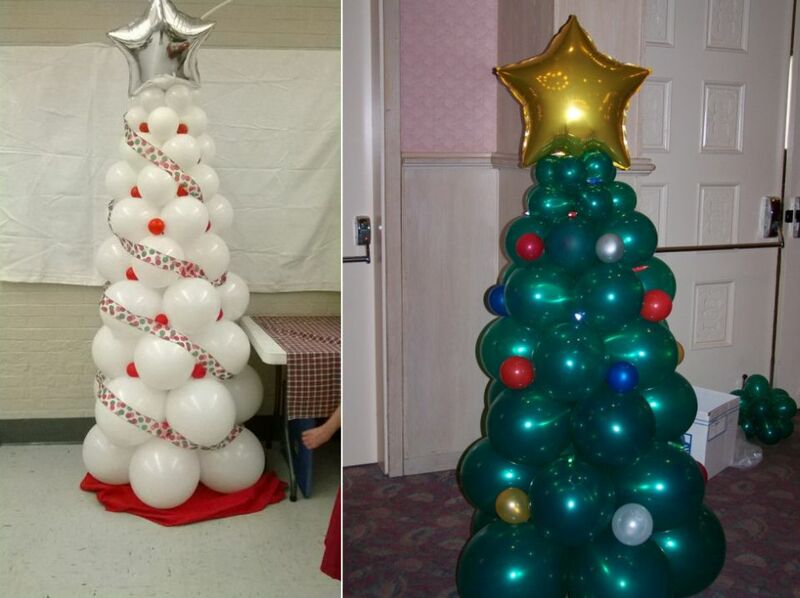 Blow up the balloons and fix them in a tree-shape using glue or cello tape. 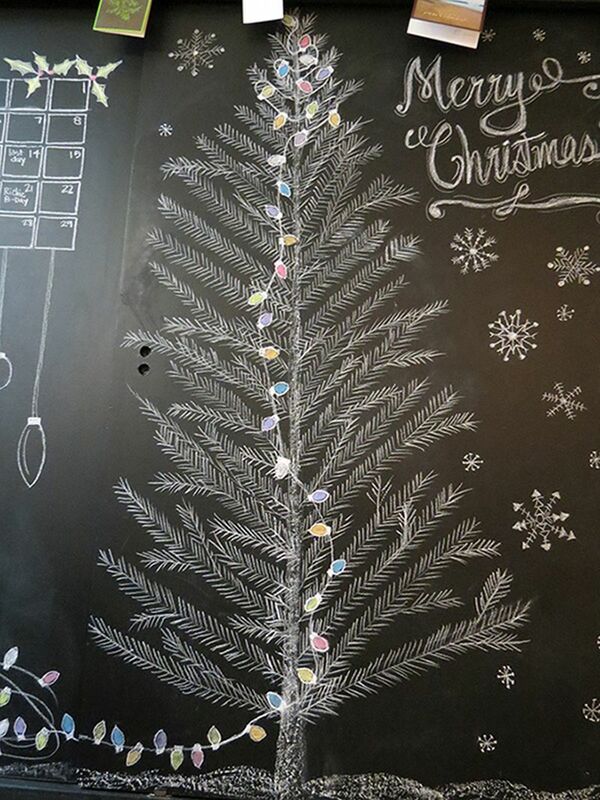 This lightweight Christmas tree can be decorated using glitter and you can even draw on the balloons. 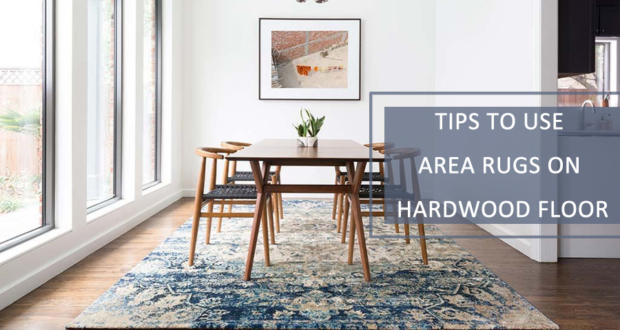 See below how you can do it. 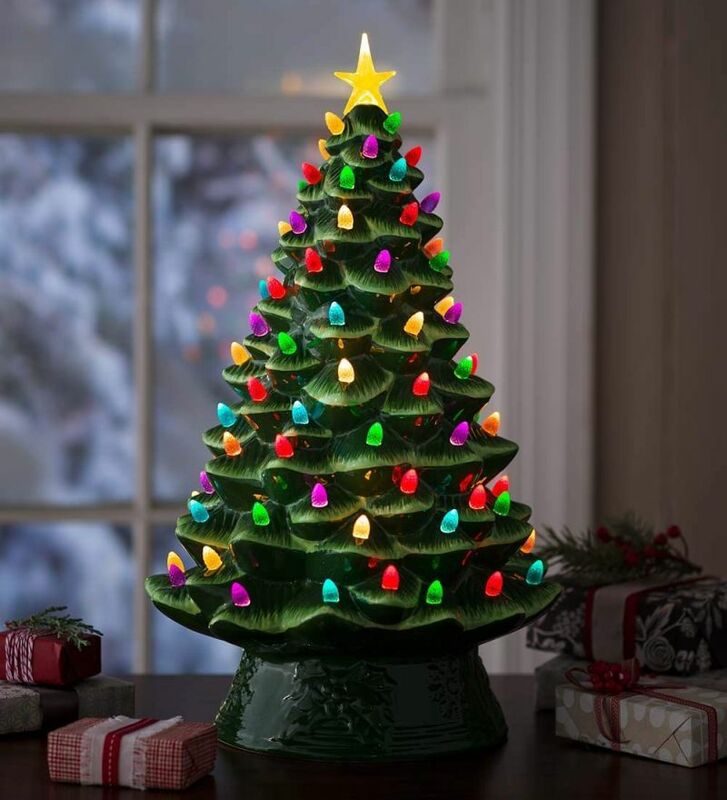 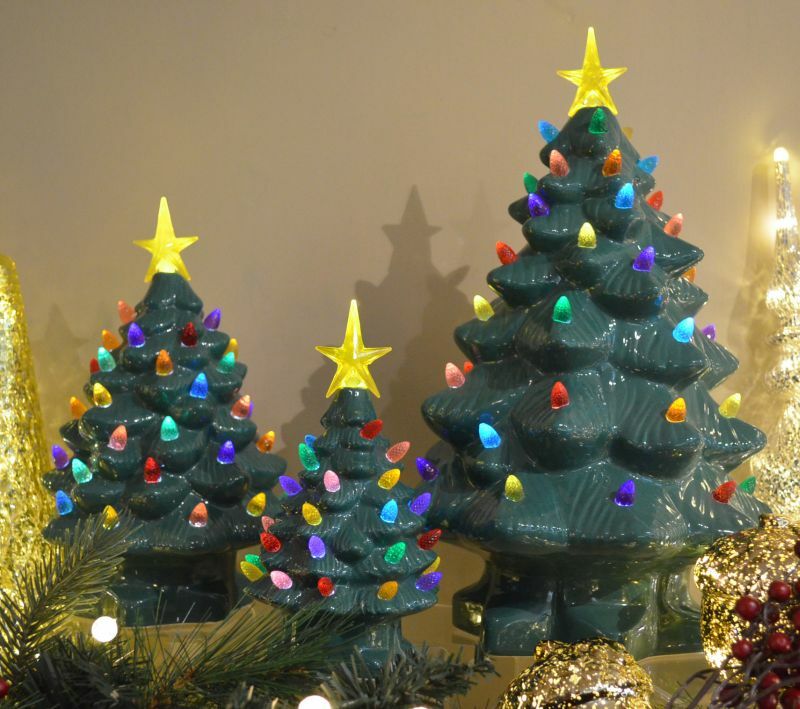 This 10″ tall painted porcelain Christmas tree is decked with faceted, multicolored LED bulbs. 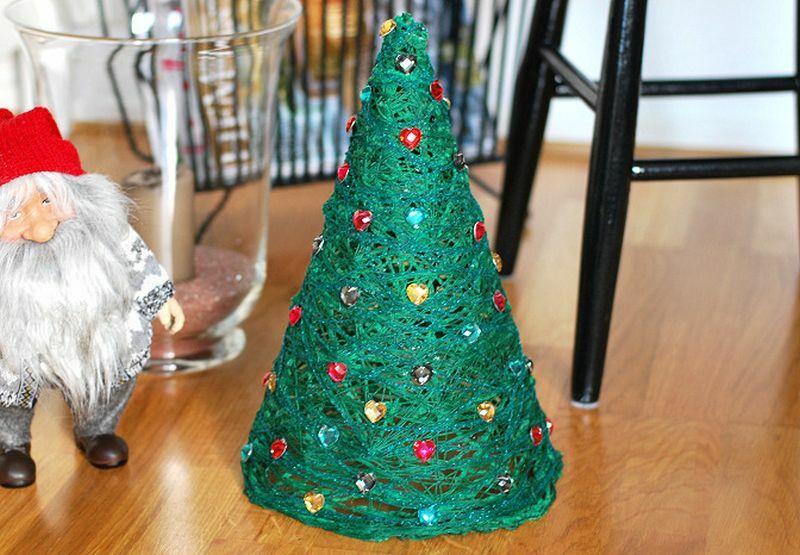 There’s also a lighted star topper to complete the look. 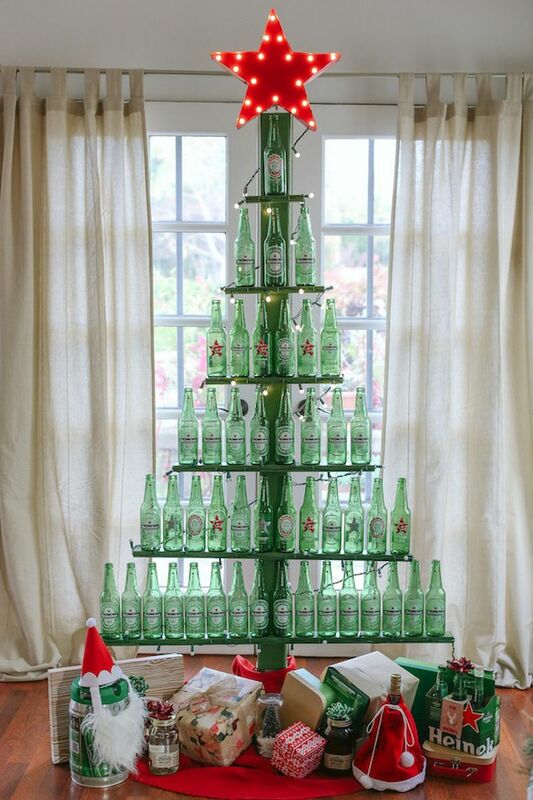 It’s simple yet impressive, give it a try if your like. 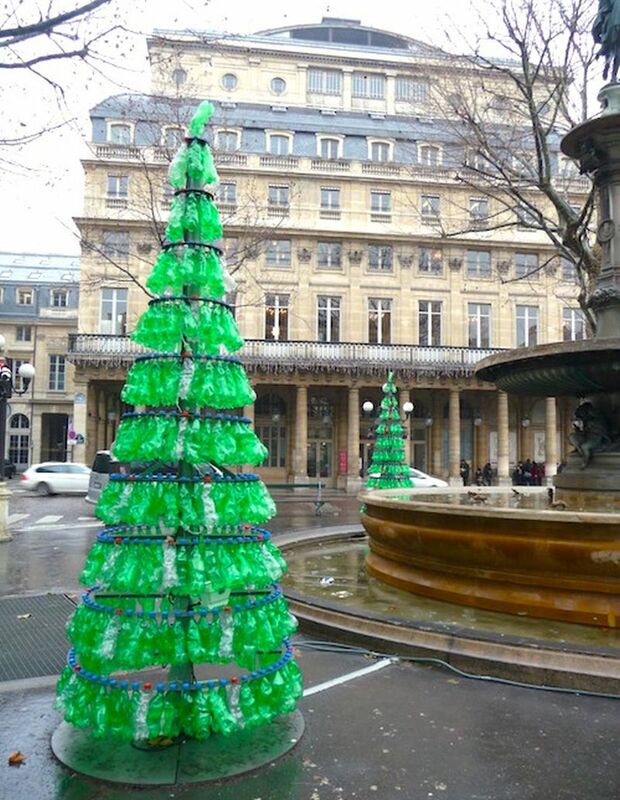 Fabrice Peltier made this Christmas tree using a number of waste plastic bottles. 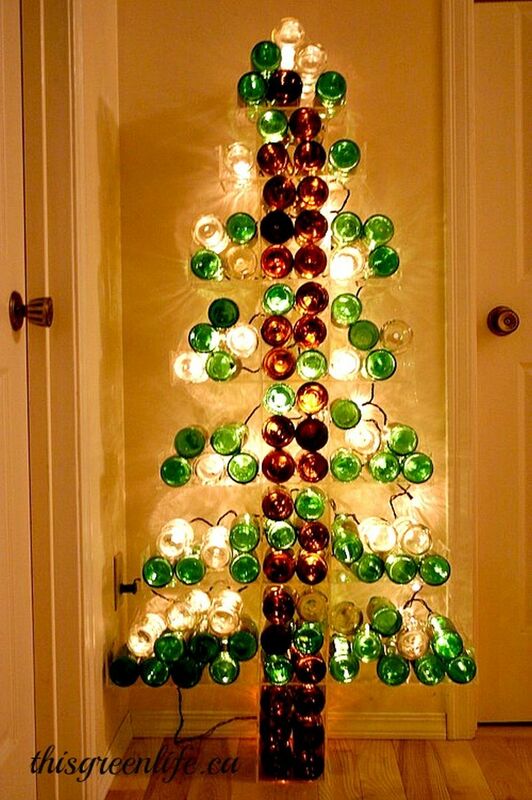 It is a pretty good idea to reuse plastic bottles. 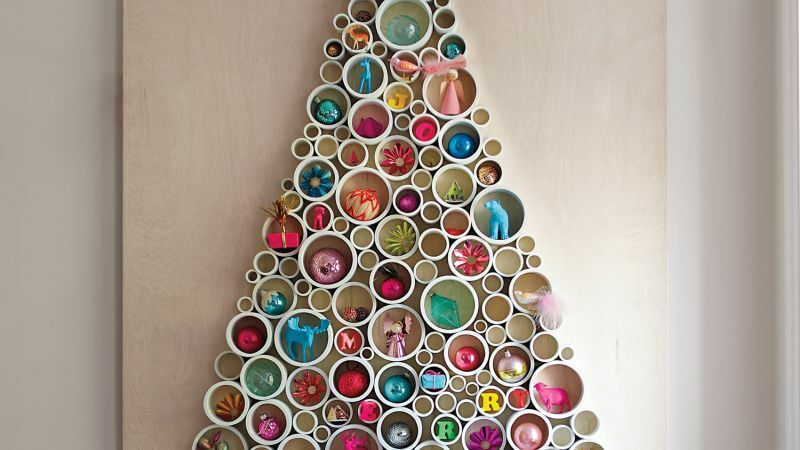 Looks difficult, but could be easy to build, if you have patience and zeal. 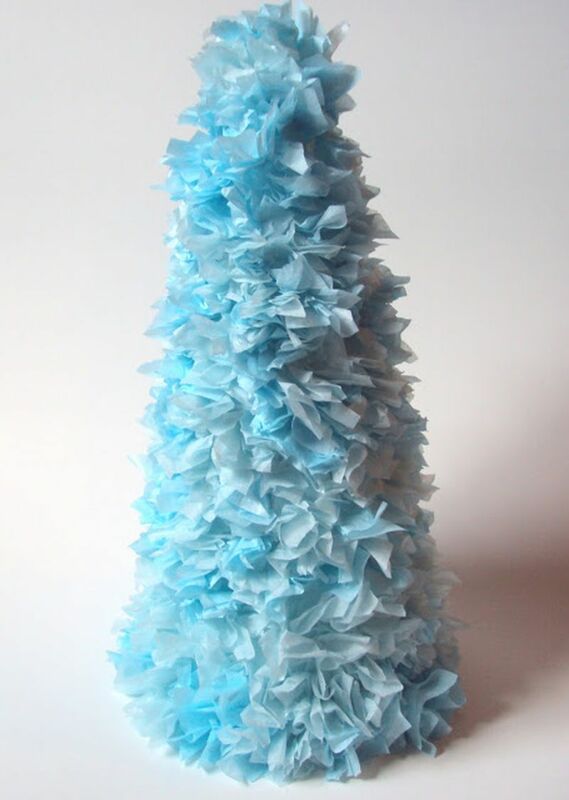 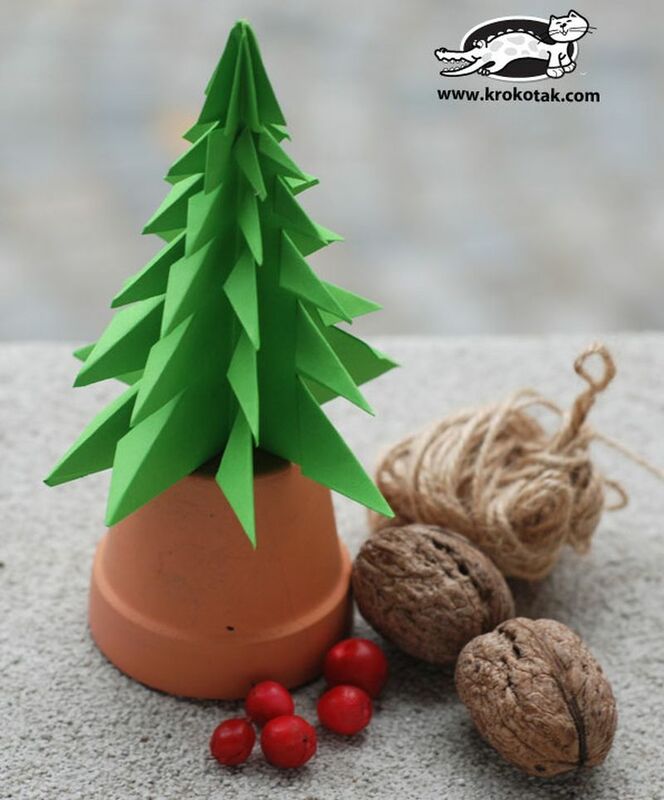 Origami Christmas Trees can be easy craft idea for kids. 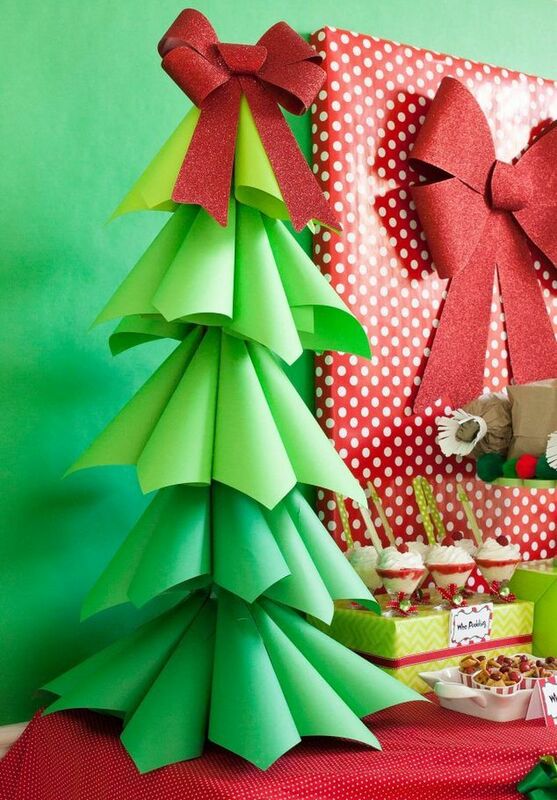 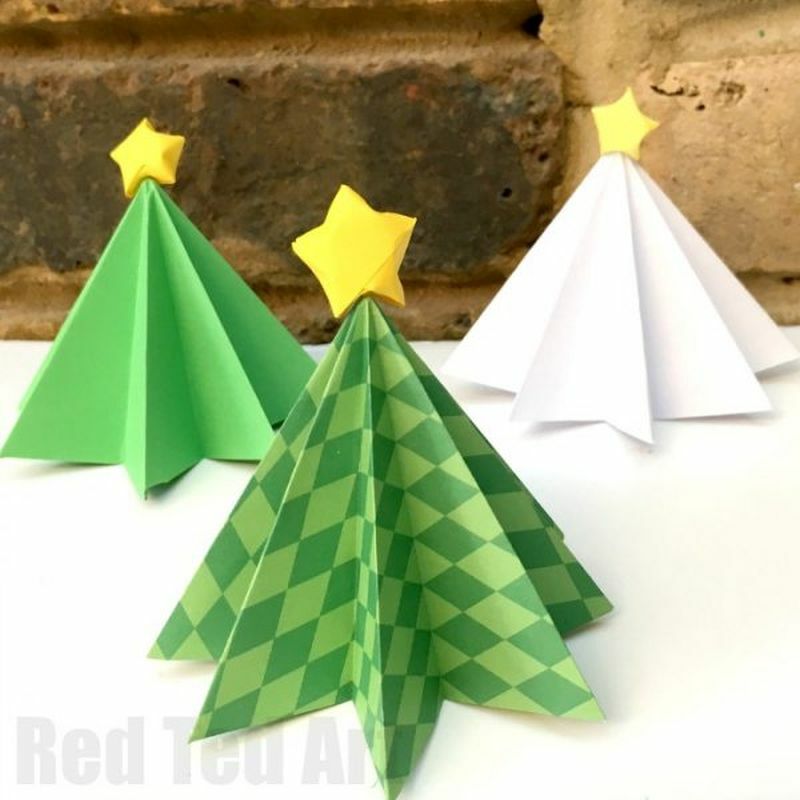 These paper trees are a cute addition to Christmas decoration and even kids can be involved. 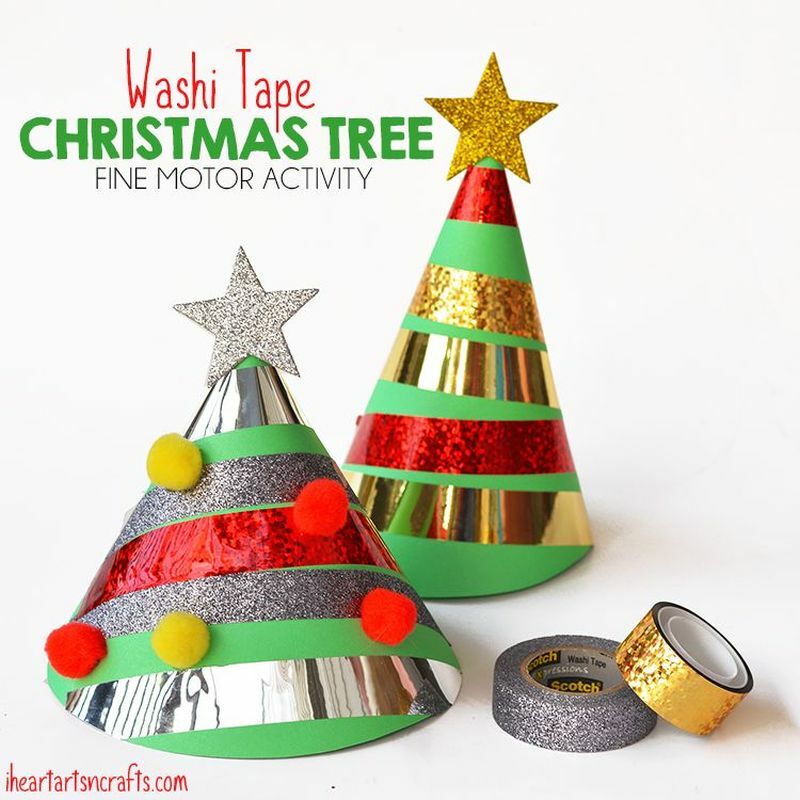 A good way to make productive use of your family time. 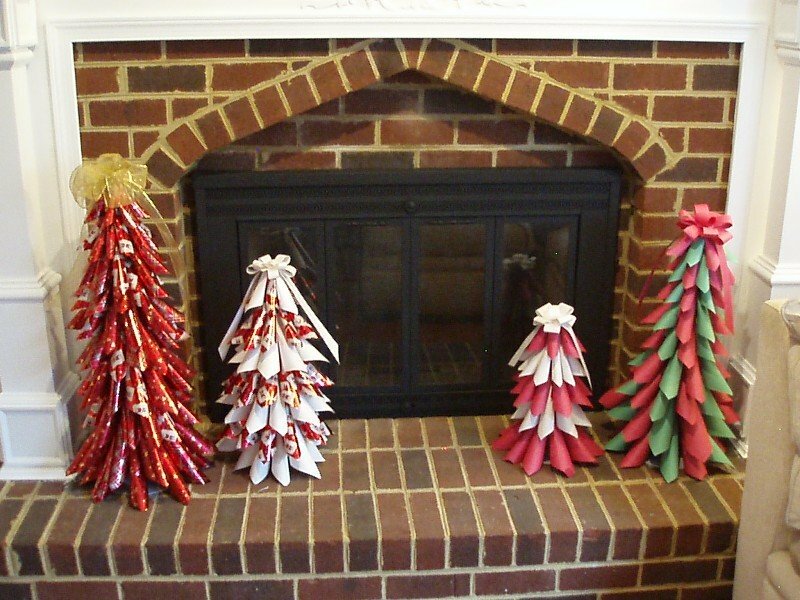 Fold paper to form a cone and glue it all over with pieces of tissue paper to make this wall-hanging tree. 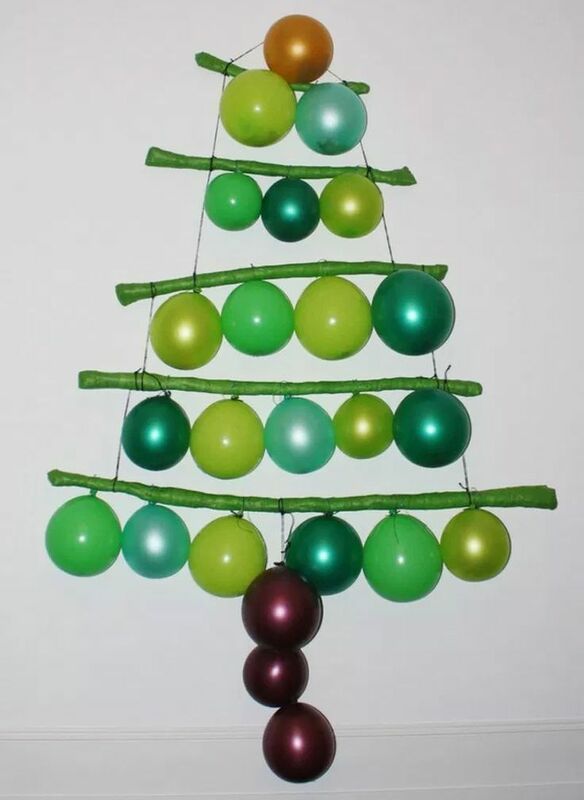 Decorate it with small beads and voila, you have a Christmas tree ready. 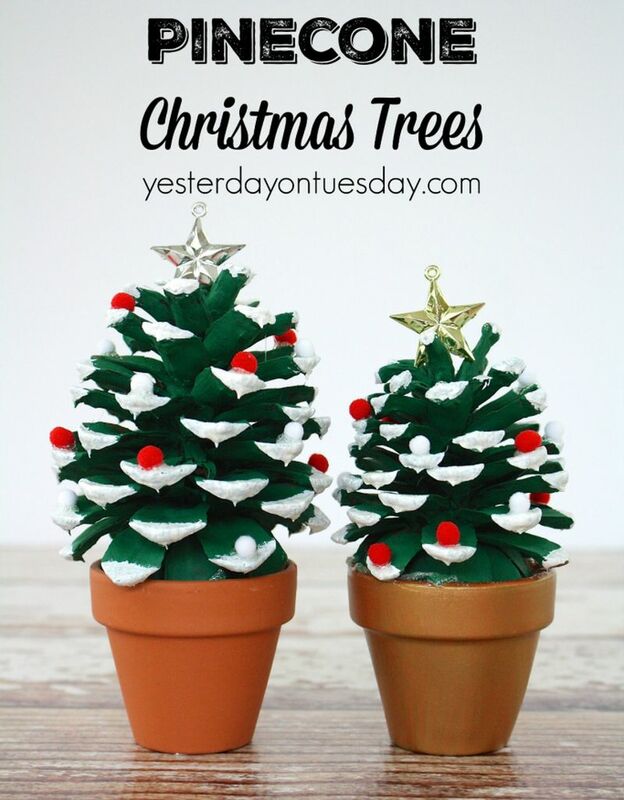 You’ll need terracotta clay pots of different sizes for this DIY Christmas tree. 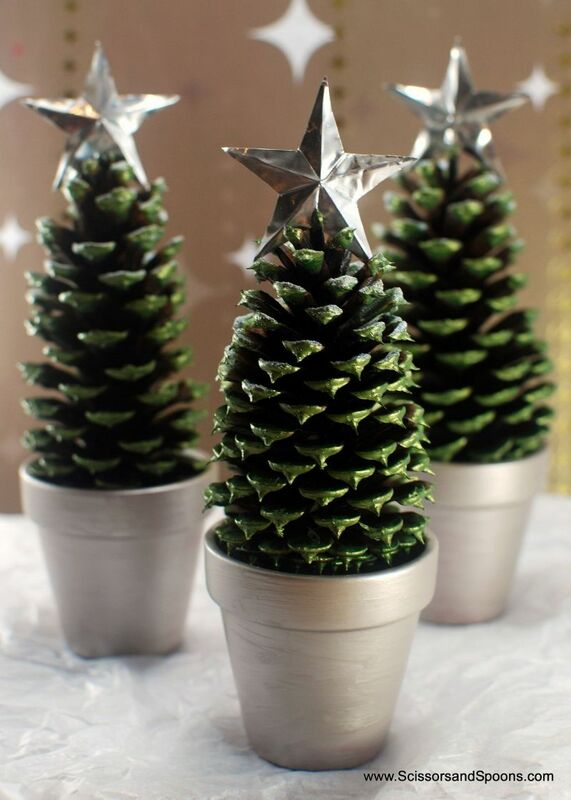 Just paint them and stack one over the other to look like a tree. 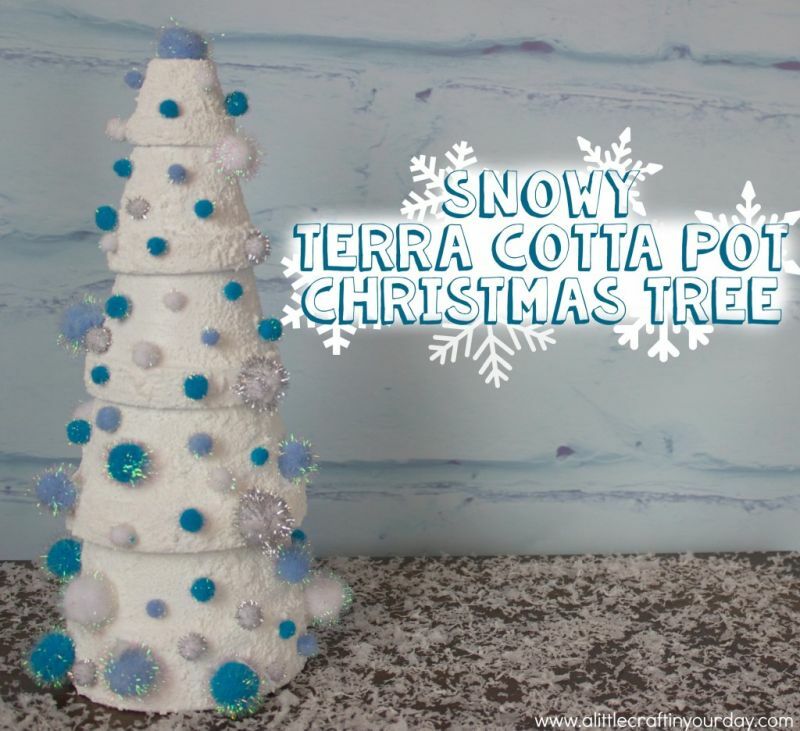 Decorate it with beads, gems, glitter, and a star tree topper. 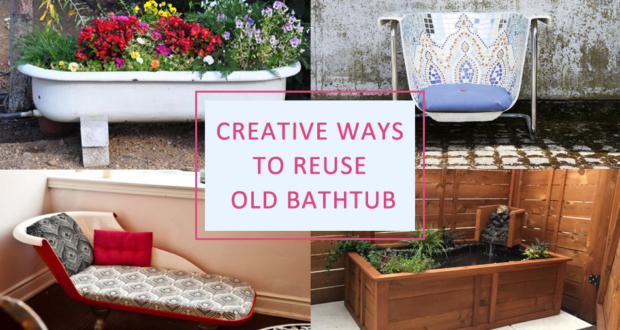 See some ideas for inspiration below. 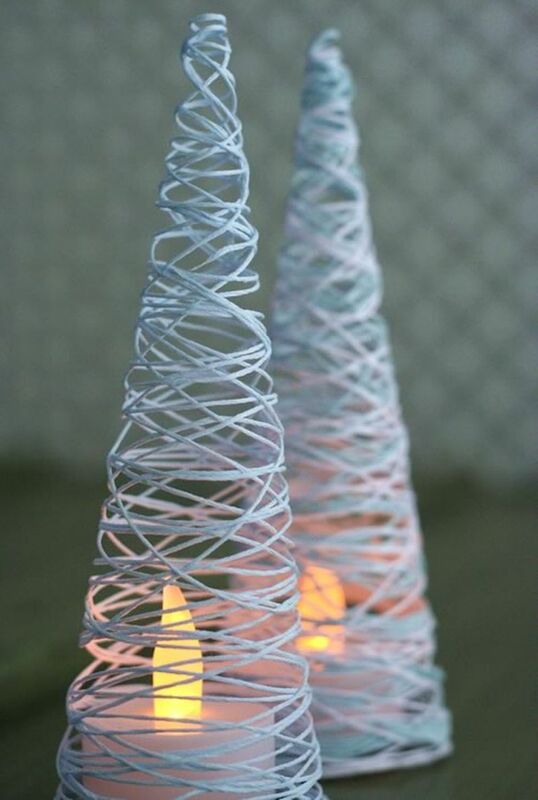 Make a cone out of paper and glue up twine all around the paper cone. 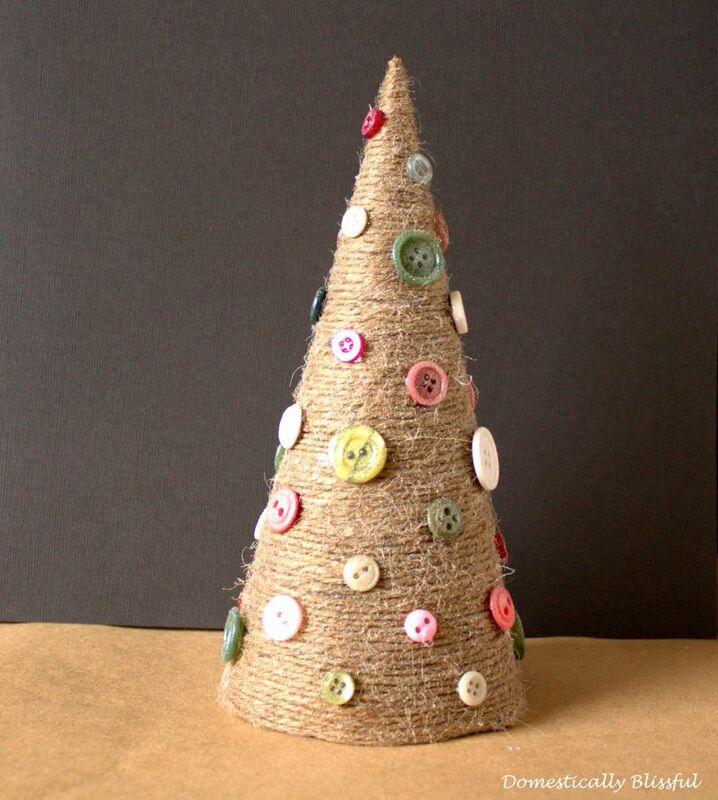 Decorate it with buttons and other ornaments to finish the look. 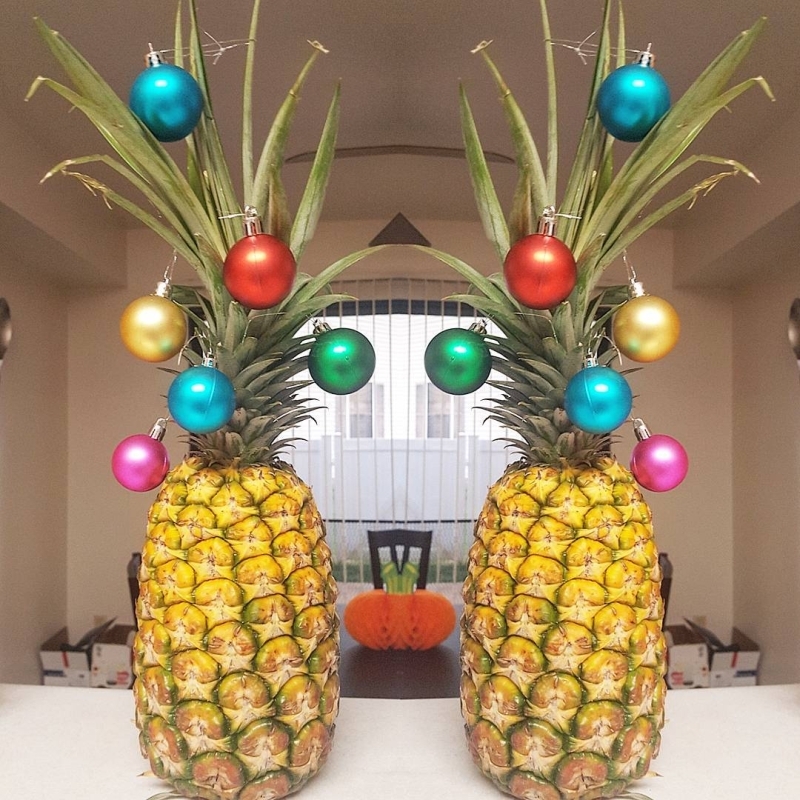 Scroll down for some inspirational ideas. 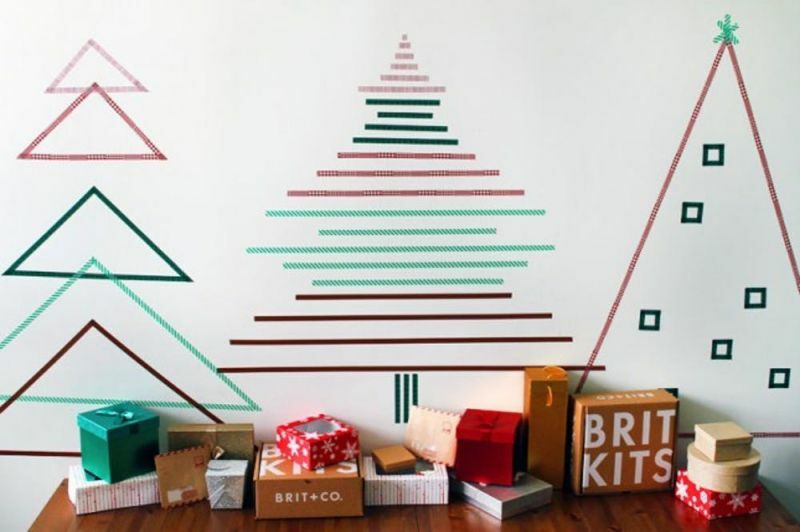 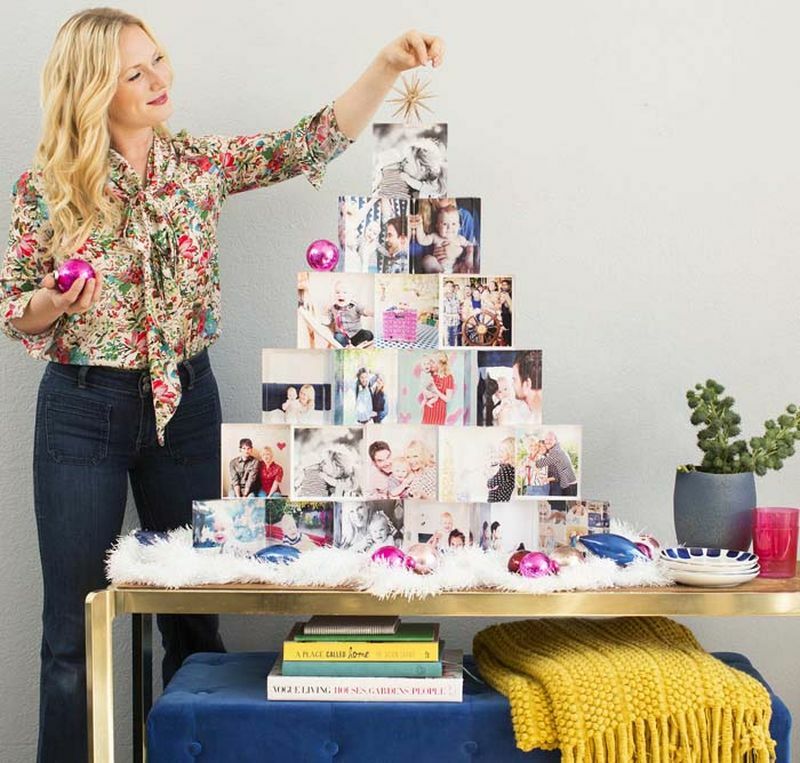 If you are short of time and space, it is your best bet to make a wall Christmas tree using Washi tape. 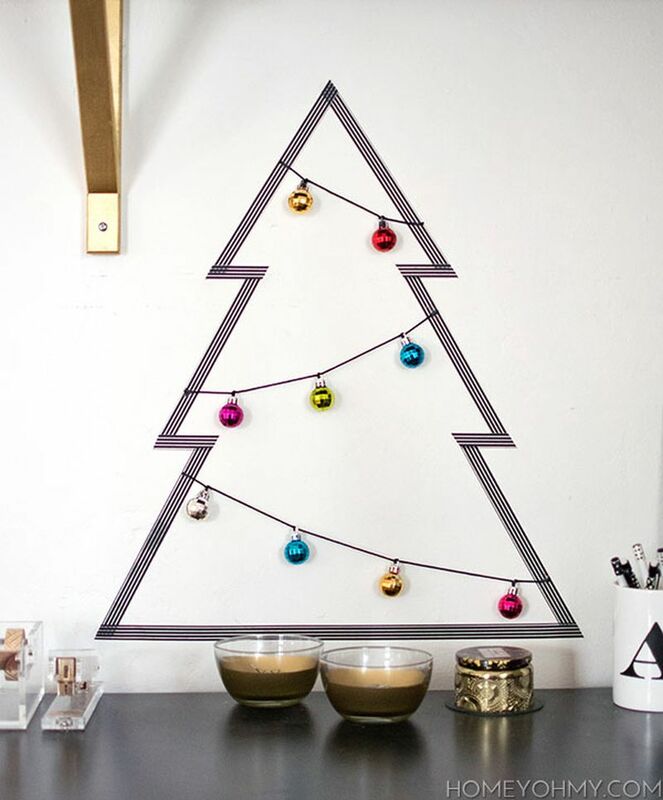 You can create a tree by drawing out floating triangles and simple strips on the wall using the tape. 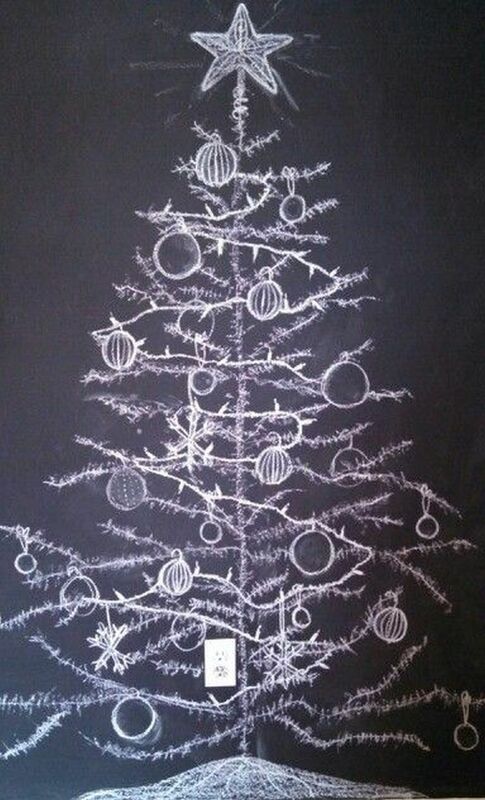 Add a whimsical touch to your home decoration this Christmas with chalkboard Christmas tree. 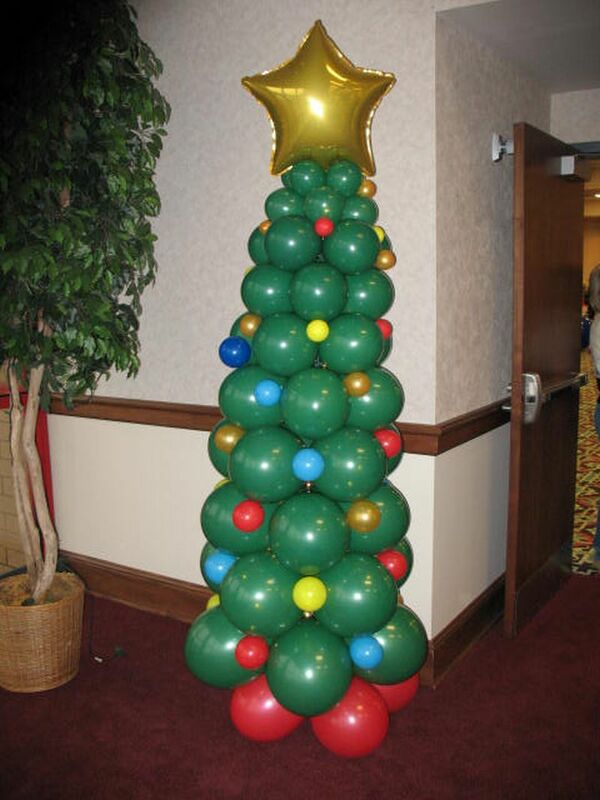 Use different colors to make it look attractive. 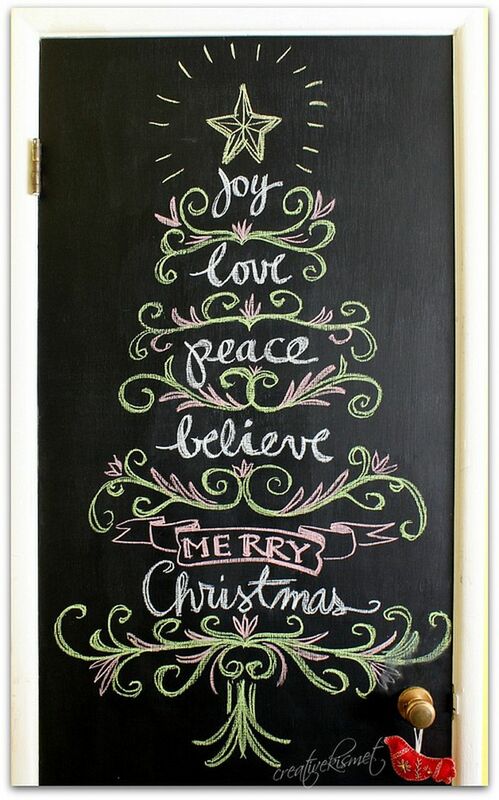 A few suggestions are listed below. 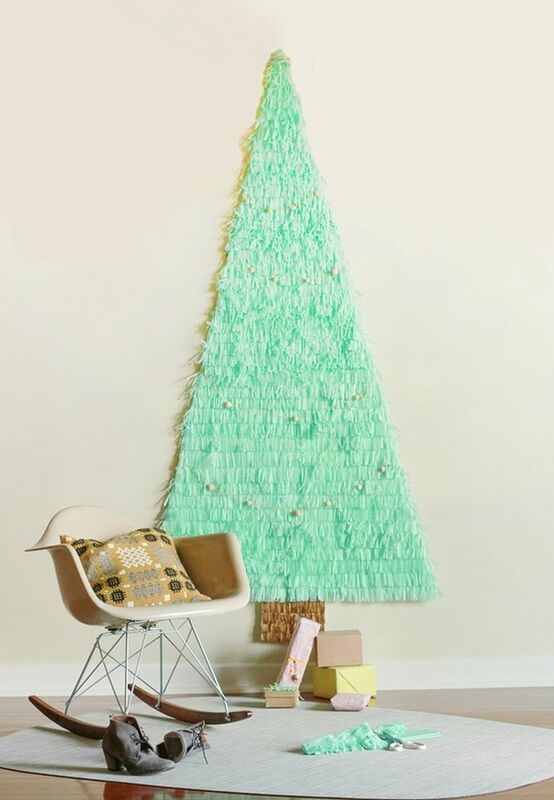 Don’t have space in your apartment to accommodate a conifer Christmas tree? 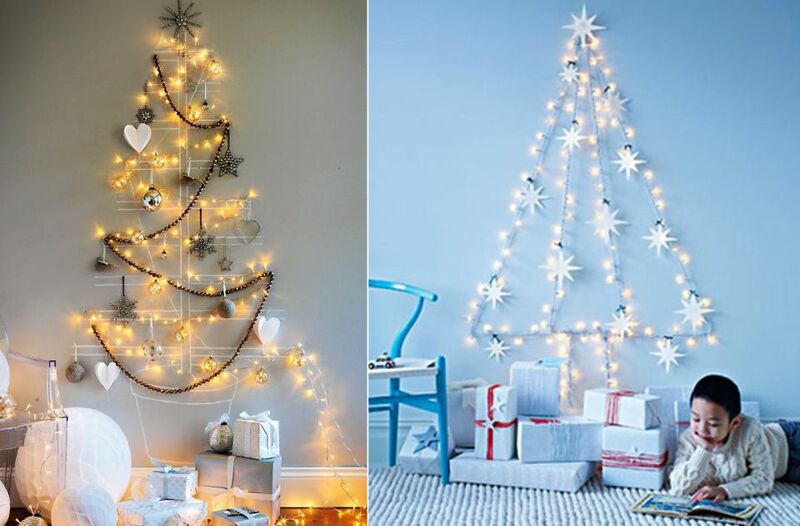 Don’t worry, you can create a space-saving tree on your wall using light strips, paper, and some other decorative embellishments. 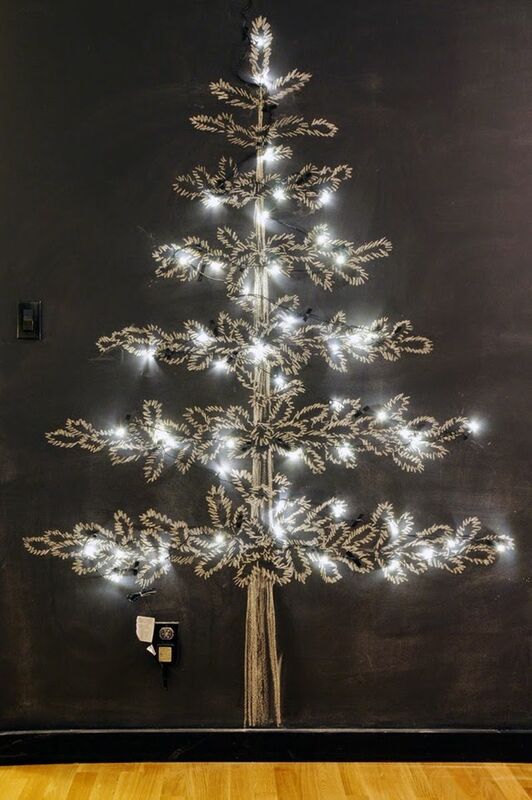 You can stick some light strip in the shape of a Christmas tree on the wall and add some goodies to it – your light string Christmas tree is ready. 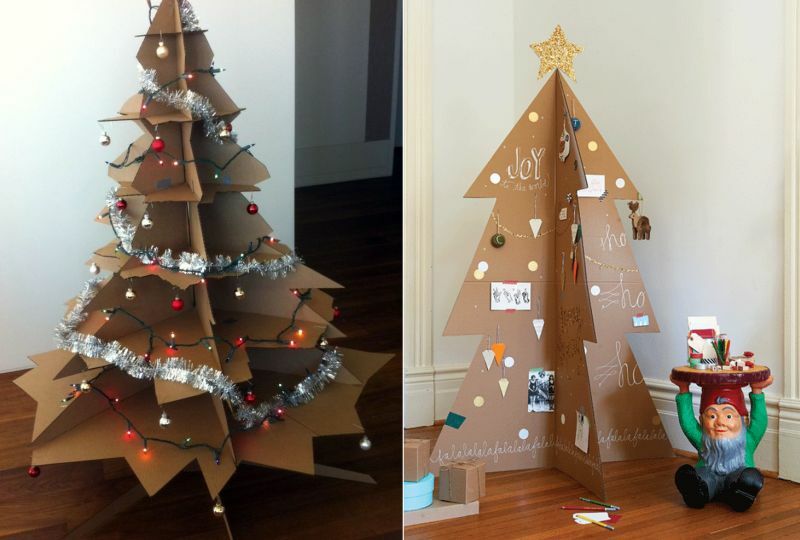 Take out all your favorite photos and stick them around empty cardboard boxes, and arrange these boxes to form a Christmas tree. 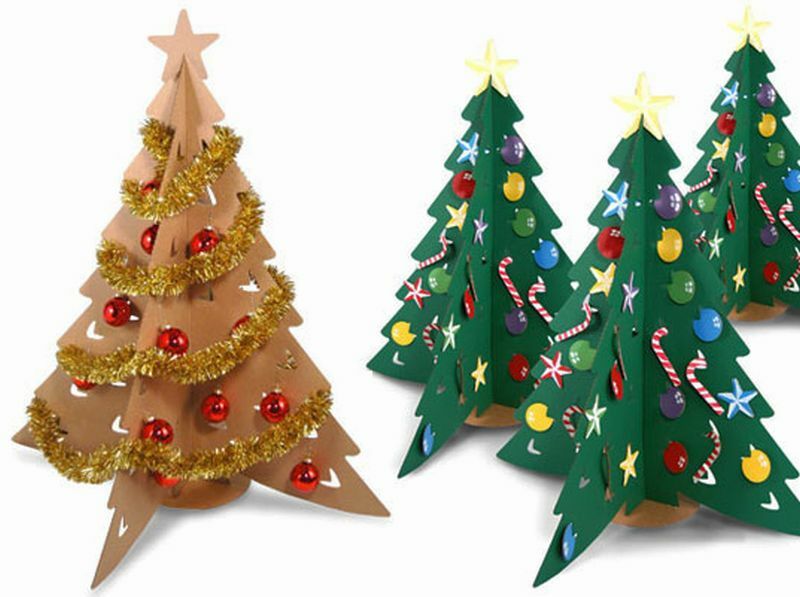 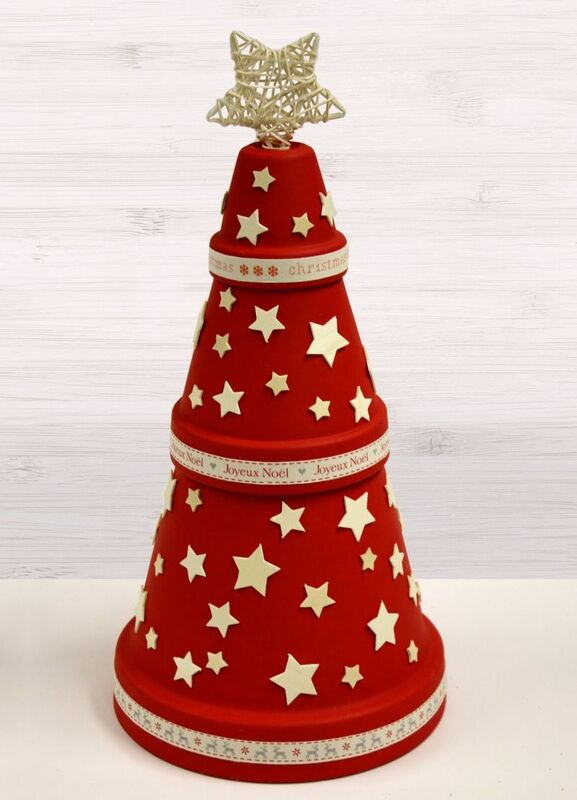 This tabletop Christmas tree will be the focal point of your celebrations as cherished memories will be displayed in a nostalgic timeline. 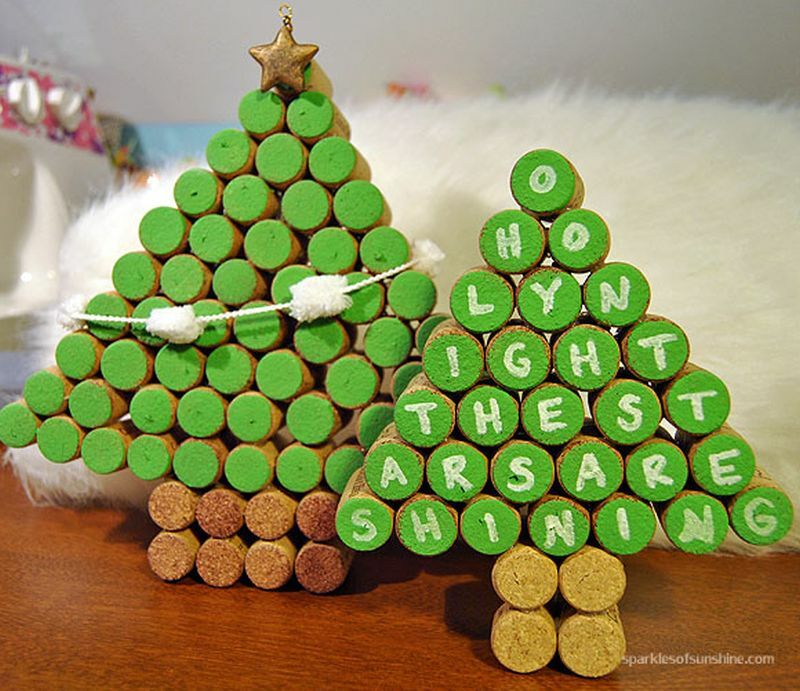 One of our favorites for sure. 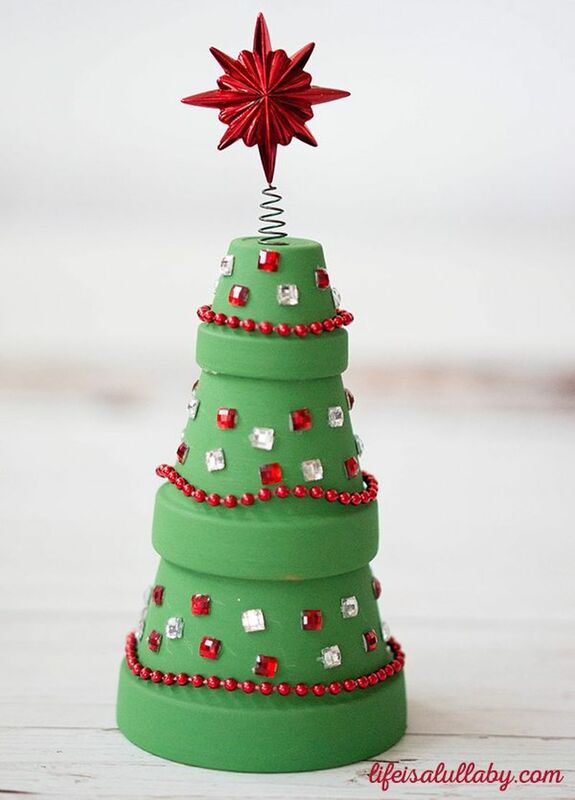 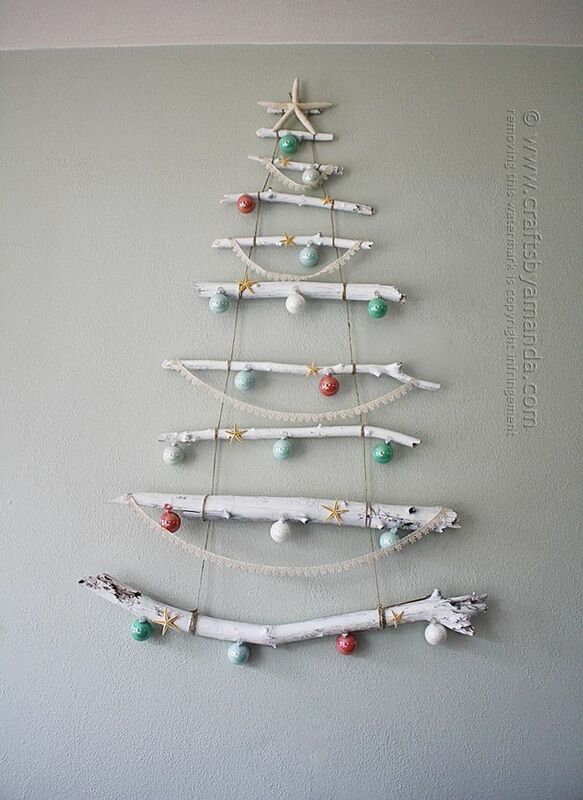 This one is a really quick and easy alternative Christmas tree idea. 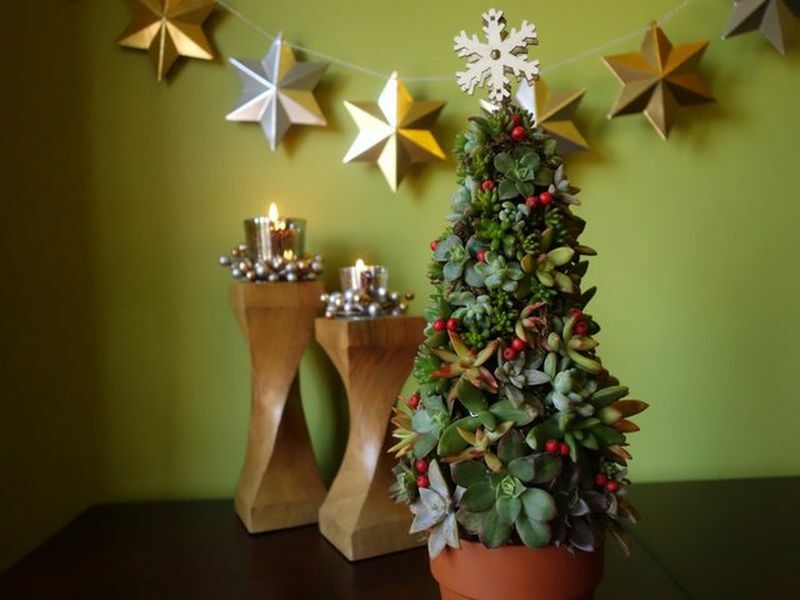 If you have potted plants at home, decorate them with shimmering light strings, decorative streamers, and shiny balls, and in no time, have a fun Christmas tree ready to make your guest go wow!